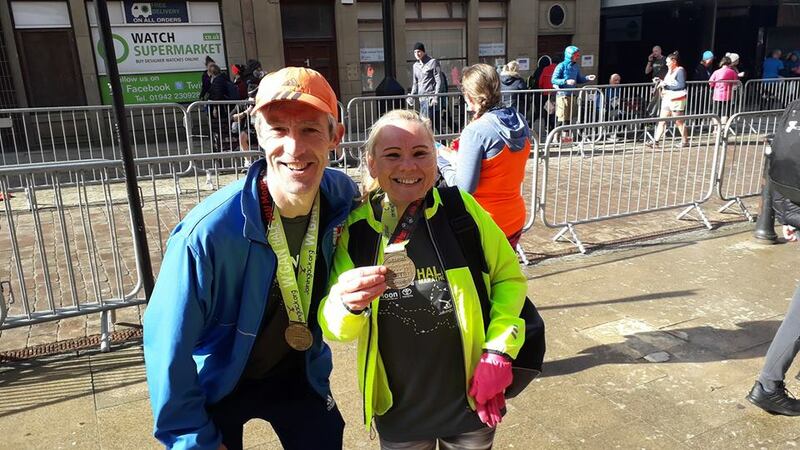 It has been a busy racing period for Joanne Nelson recently, who is in training for the Liverpool Marathon in May, which she has previously won. 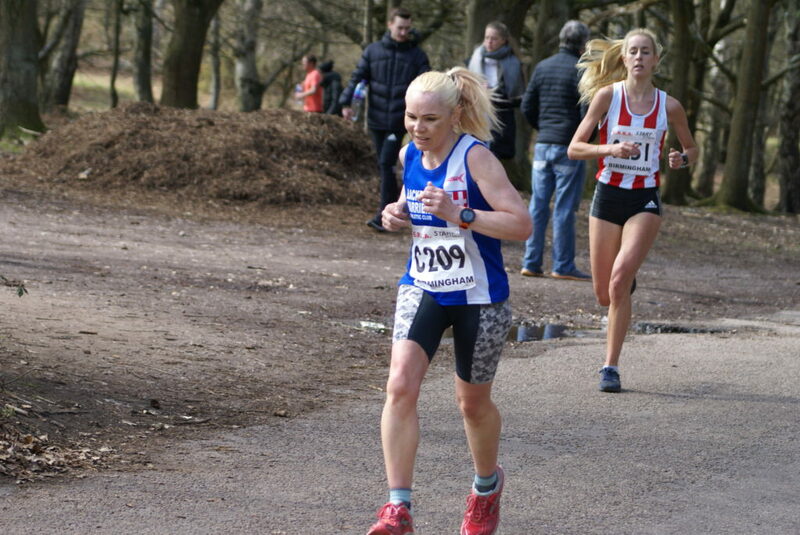 One week after running the Northern Road Relays at Birkenhead Joanne went up to run the Conistion 14 (March 30th) finishing 106th in 1hr 37.06 which was the week before running a Leg at the National Road Relays. 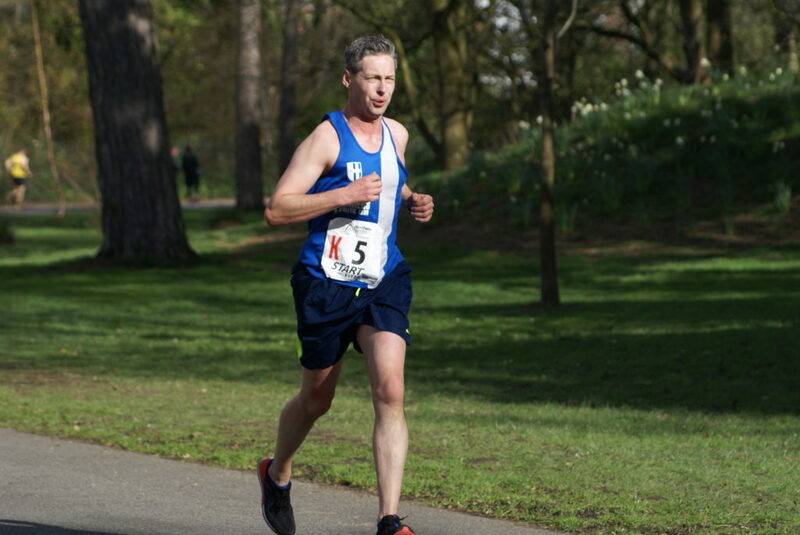 Fellow Harrier – Paul Brindle – also ran the race placing 19th overall in 1hr 24.53 (RESULTS). 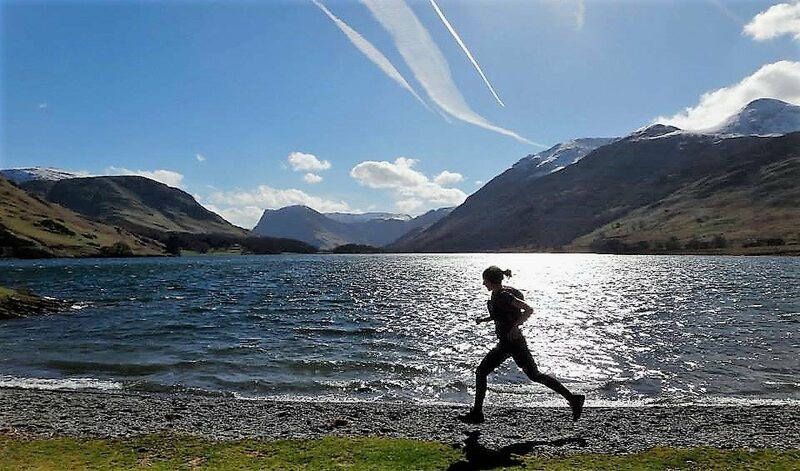 Joanne’s latest race saw her tackle a 20 miler which was part of a series of races covering 5k, 10k, Half-Marathon, 20 miles and a Marathon on the same day, which is one way of spending your Sunday! 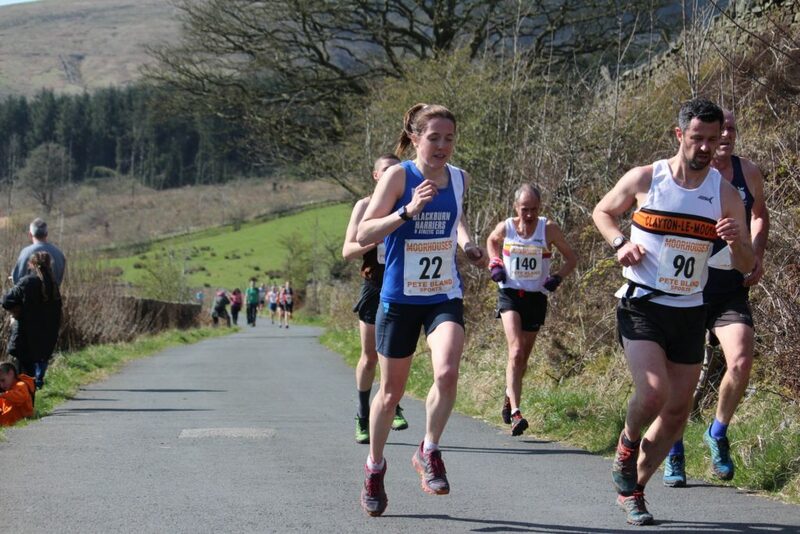 Joanne won with a time of 2hr 25.30 with another Blackburn Harrier – Janine Fallon – coming home in 2nd clocking 2hr 33.52, making it a 1/2 for the Club. 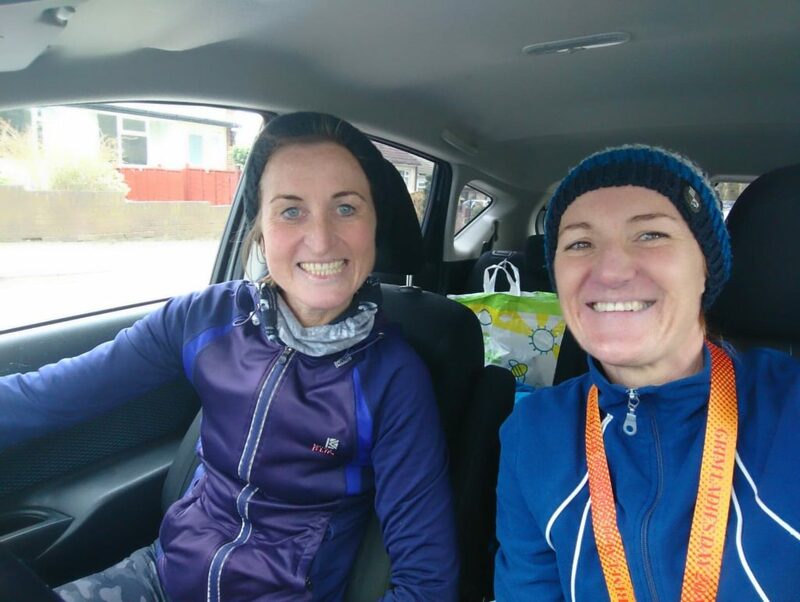 Afterwards, Joanne told the Harriers about the day saying “Janine and I decided to have a go at “it’s grim up north” organised 20 miler in Cleckheaton for marathon preparation. It’s a newly organised event this year and the second race I have run which has been organised by this group. 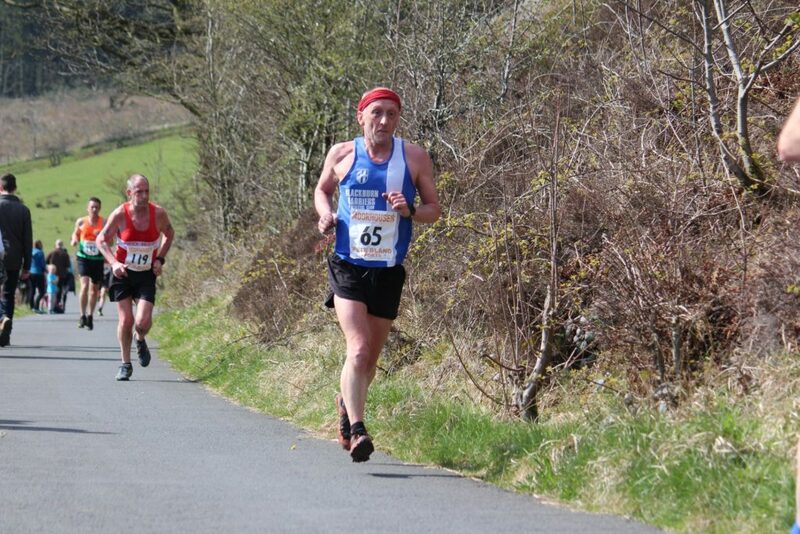 The race was a 5 mile out and back repeated; so not too great if you are tired after 10 miles!! Miles 1-5 and 10-15 are slightly downhill which means miles 6-10 and 16-20 are slightly uphill. The event included many races, not just the 20 miler, but also 5k, 10k, 10 miles, half marathon, marathon and an ultra marathon. It’s fair to say that it was absolutely freezing and we were both happy to finish. 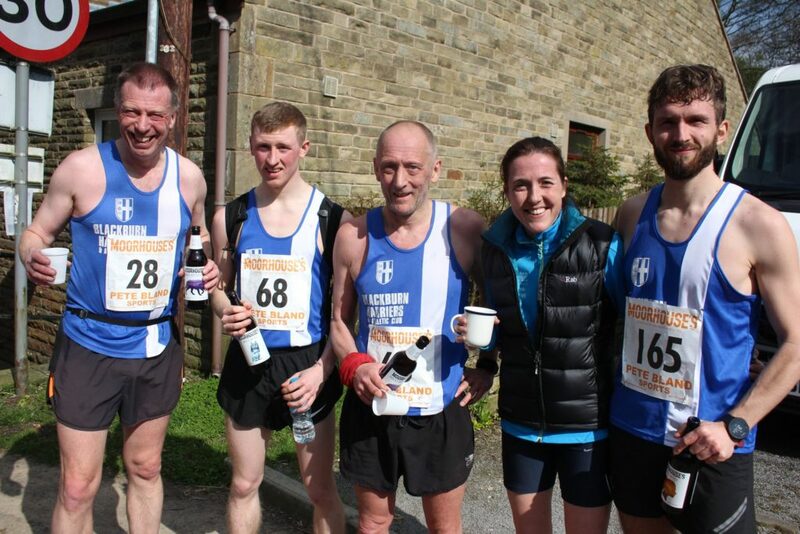 First and second place secured for Blackburn Harriers ladies and to top it all there was a selection of free cakes, a choice between free beer, cider or lager, and a medal and trophy. Tony Balko (V50) has already got a number of competitions under his belt this season, recording a couple of wins at the Spenborough Open in the Hammer (37.83m) and Shot (11.08m). He backed that up at Scunthorpe with another win in the Shot (11.24m and a new PB) and his fourth win in a row, taking the Hammer (37.18). On the 10th April in the Northern Masters League he placed 3rd in the Shot (10.58m) and 2nd in the Hammer with 36.59m). At the Wakefield Open on April 7th, Tony won the Hammer with 37.29m, came 2nd in the Discus (34.31m) and rounded off with another win in the Shot (10.48m). 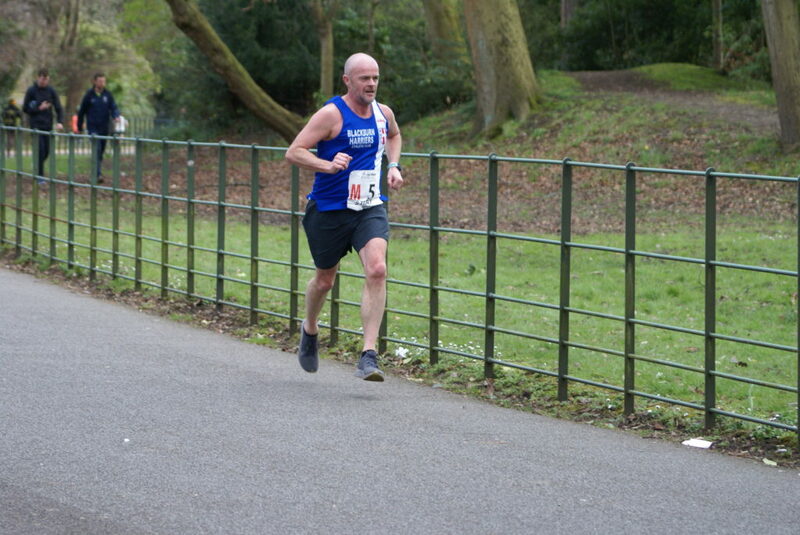 His latest competition saw him at the Northern Masters League again on April 10th where he placed 3rd out of 7 in the Shot Putt (10.58m), and in the Discus with a throw of 36.59m coming in 2nd. Six Wins, two 2nd and 2 x 3rd places as well as a new PB in the Shot represents a pretty solid start for the 2019 season. 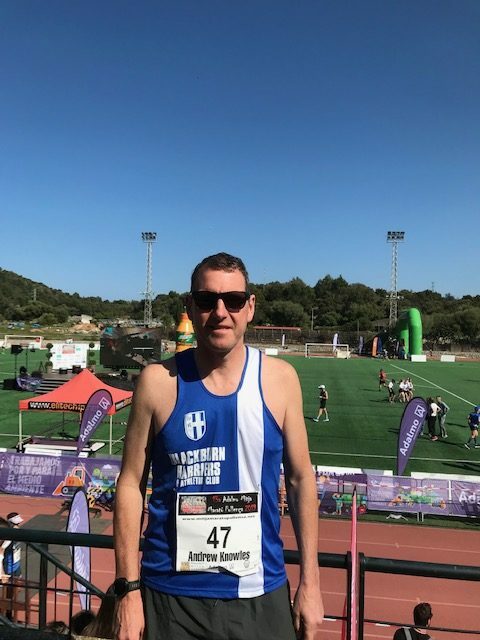 Andrew Knowles is training for a Half-Ironman and as part of his build up he entered this half-marathon in Majorca on Sunday April 14th. He preceded this race with a bike ride in the mountains the day before lasting three hours and still managed to clock 1hr 50.02 in the race following his mountain efforts. 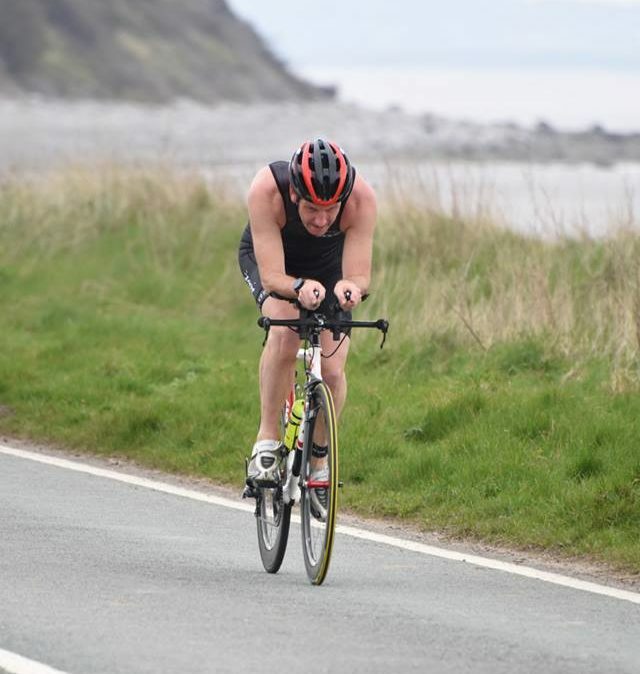 Andrew spoke to the Club about his training weekend saying “The ‘aim’ was to start with tired legs to mimic triathlon race conditions, so the day before I rode over the mountains for 3 hours. Didn’t quite go to plan as I blistered badly having to stop a few times and take my trainers off and sort my feet out. However I felt the objective was achieved as the whole run was on ‘empty’ so perfect training. 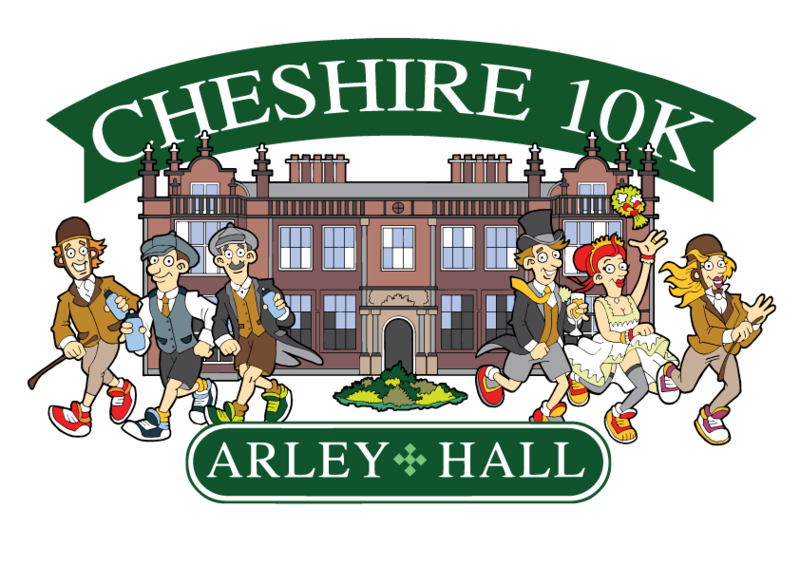 10k and 5k’s races also and a brilliant atmosphere, highly recommend”. 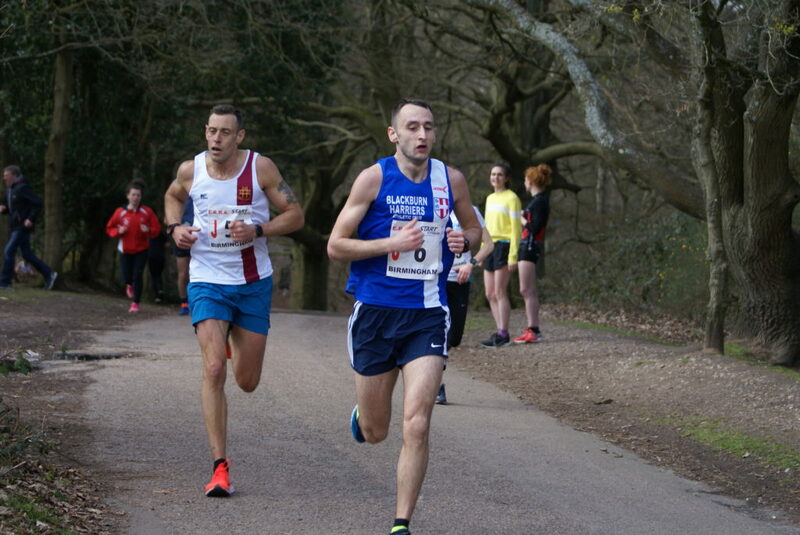 Paul Jeffries (V40) went into this race – featuring some 300 runners, won in a time of 33.47 (Campbell Ross) – with a personal best time of 40.51 set at the Pilling 10k in 2018. 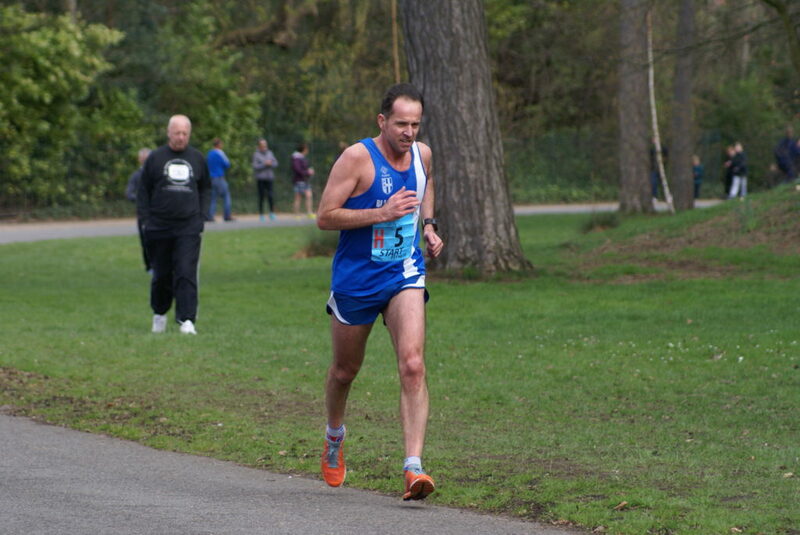 In this race, Paul came across the line in 25th place, clocking 40.41 for a ten second new PB. After the race, Paul reflected on his current form and the race itself saying “the Three Bridges is a race i have done a few times before. I have been getting a lot of advice and support at the club and i am enjoying my running a lot more. Last year i found it tough going in this race finishing with a time of 46:58, which was a slight improvement on the previous years 48:45. 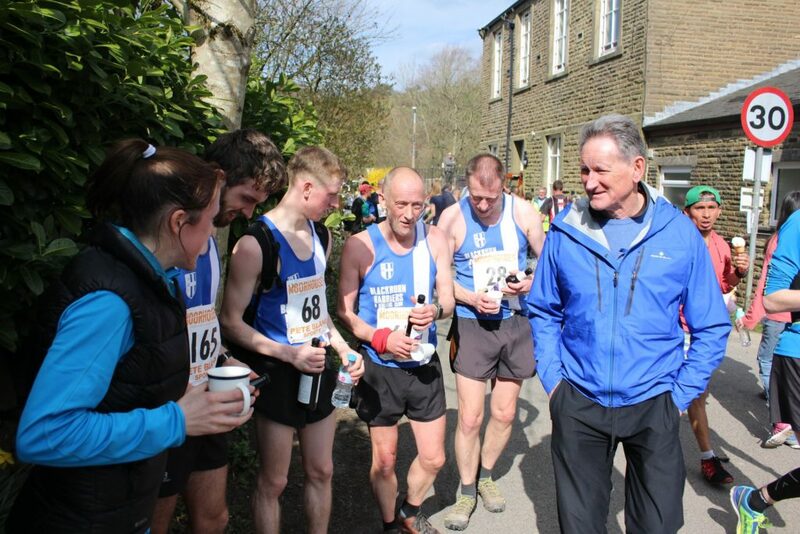 I feel i have benefited in a lot of ways by taking part in team events like the road relays and mid lancs xc, and by listening to all the advice given freely at the club. 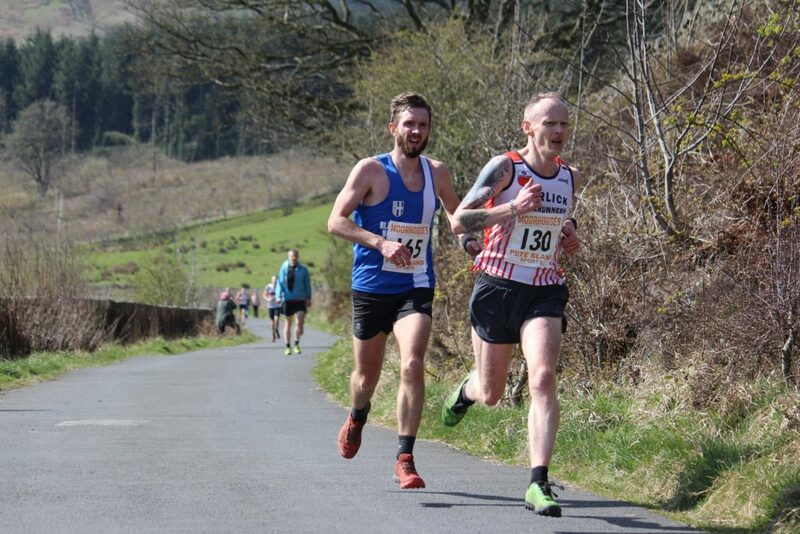 So today i had another crack at the course and came in 25th place in 40:41 which i think is a new pb for me, i have trained a lot more but i couldn’t of done it without the support of clubmates and coaches, many thanks”. Many thanks to Paul for being part of the Club and we look forward to more new personal best times in the year ahead from him. 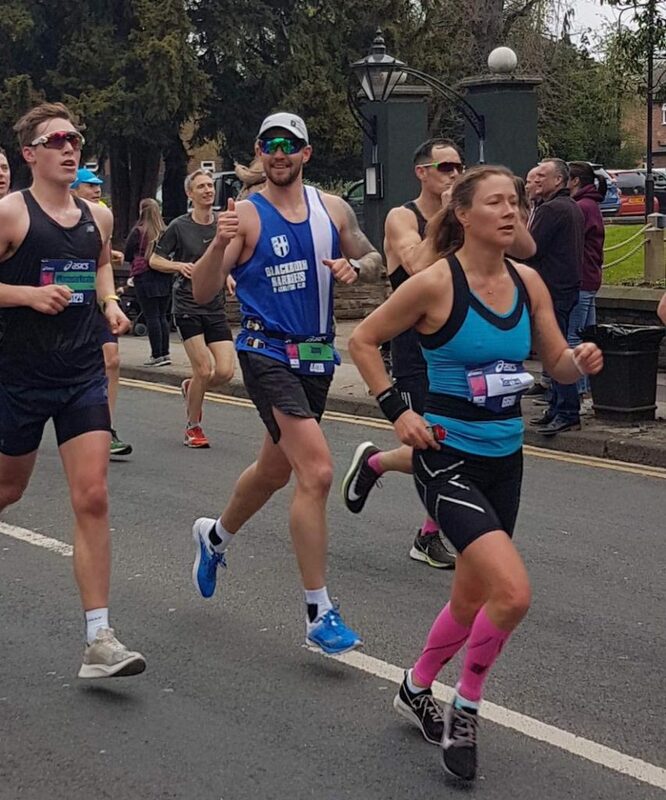 Jonny Murphy ran his first race of 2019 – The Manchester Marathon last weekend. 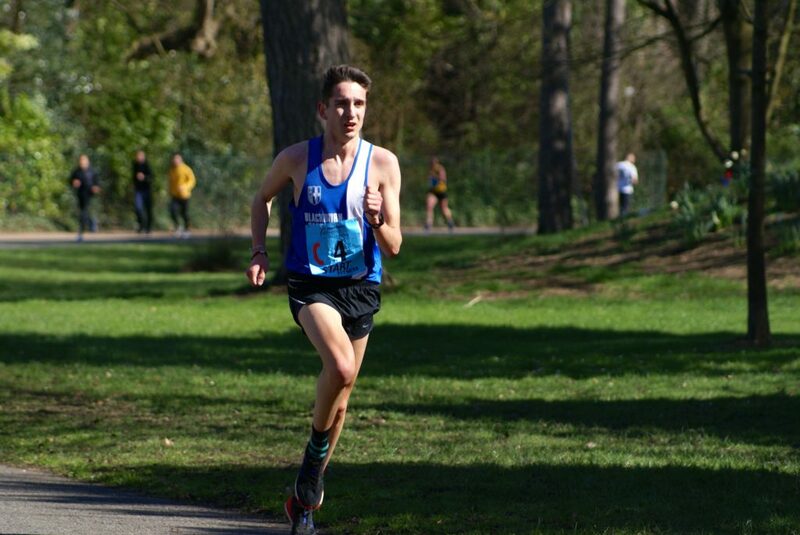 This was his fourth ever race on the road, having run two 10k’s (36.22 & 37.08) and a half-marathon (82.36) in 2018. 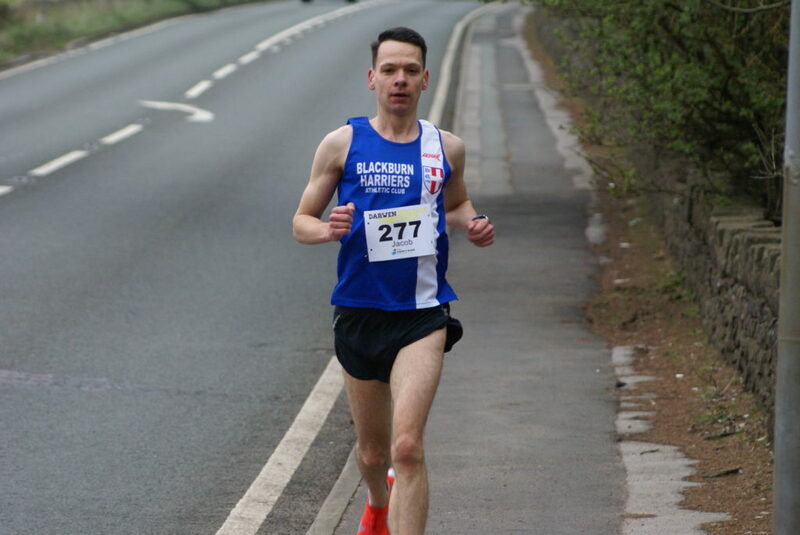 At Manchester he had a great run to break the 3 hour barrier at his first attempt finishing in 645th with a time of 2hr 56.50. A clearly delighted athlete, Jonny spoke to the Club afterwards and said “Where can I start… Manchester marathon was my first marathon, and having only 3 months to prepare for a marathon a lot of people may have thought I was a a bit mad, but having recently left the marines feeling like I hadn’t succeeded I needed a challenge of this magnitude to fuel the fire again! 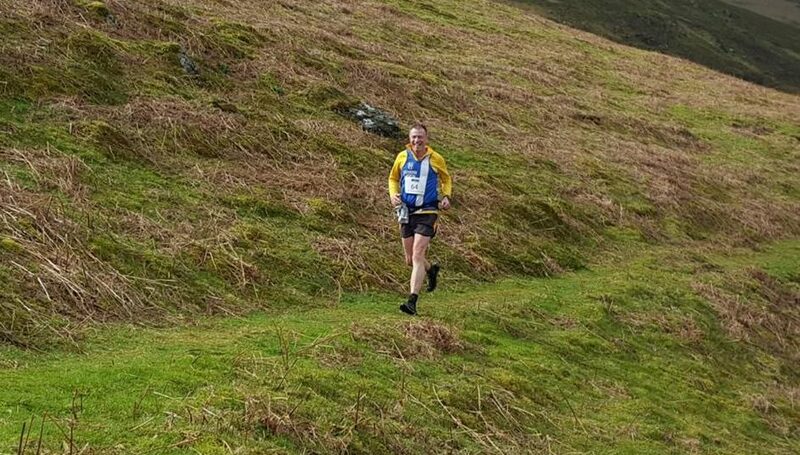 The race started and for the first half I felt strong and like I could have pushed a faster pace but I stuck to the game plan and advice of fellow Harrier, Paul Brindle who had some good tips and advice! Thanks Paul .I tried to just run consistent comfortable pace throughout and maybe even push the second half of the race a bit faster depending on how I was feeling. I couldn’t have asked for a better day everything from the weather to the crowds in Manchester where perfect everything just clicked and came together on the day all the training recently with Blackburn Harriers payed off and I enjoyed every minute of 02:56:50 running around Manchester, and look forward to getting back to training and look at what’s next”. 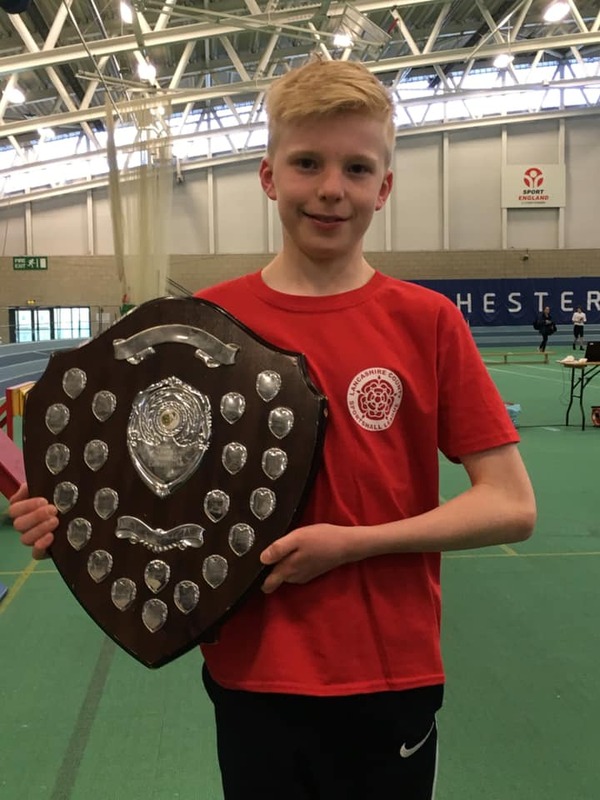 U15 Ben Boocock – the U15 Silver Medallist over 60m Hurdles in the Northern Indoor Championships earlier this year – ran his first race over 80m Hurdles at Trafford and cut three tenths of a second off his best time achieved in 2018 when he won his race in a new PB time of 12.33. 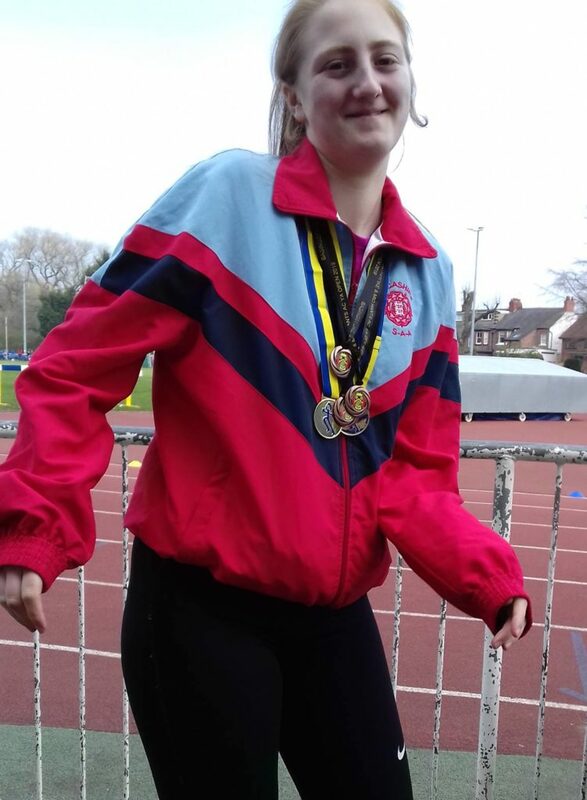 U15 Nicky Saunders had a busy weekend as she competed at the Basingstoke Open Meeting on Saturday in Discus, Hammer and Javelin where she placed 7th in the Discus (1kg) with a throw of 25.56m, 8th in the Hammer (3kg) with a distance of 32.38m and 5th in the Javelin with 25.29m. 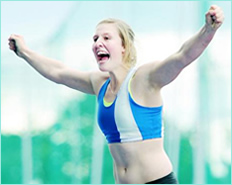 The day after, Nicky was at the Trafford Open where she won the Discus (1kg) with 28.04m and finished 2nd in the Javelin (500g) with a distance of 24.59m. 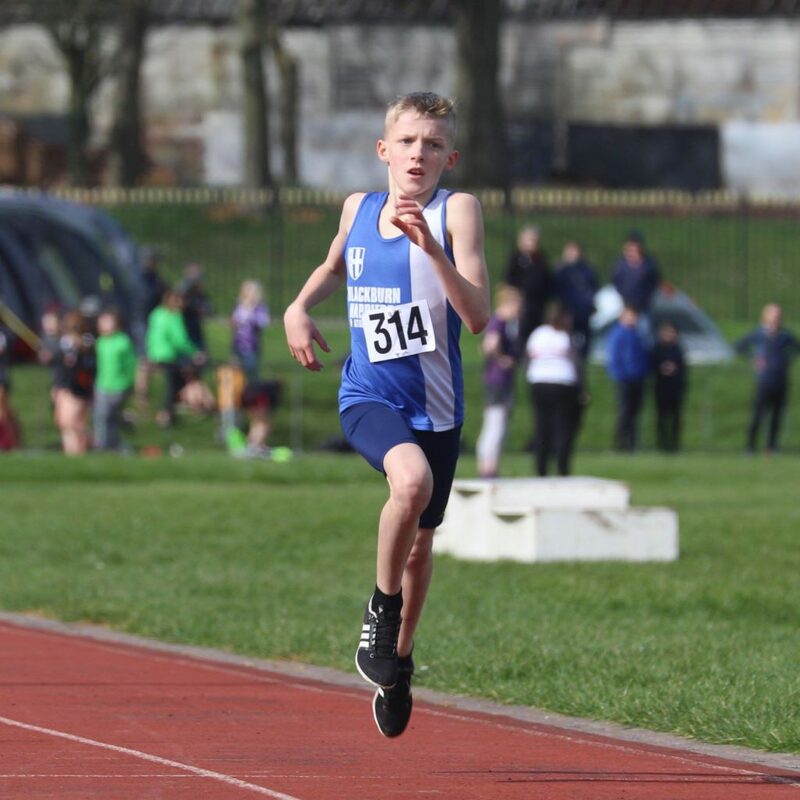 U15 Saul Sharp ran in the 1500m chopping a huge seventeen seconds off his previous best to set a new PB of 5.10.34 in the 1500m. 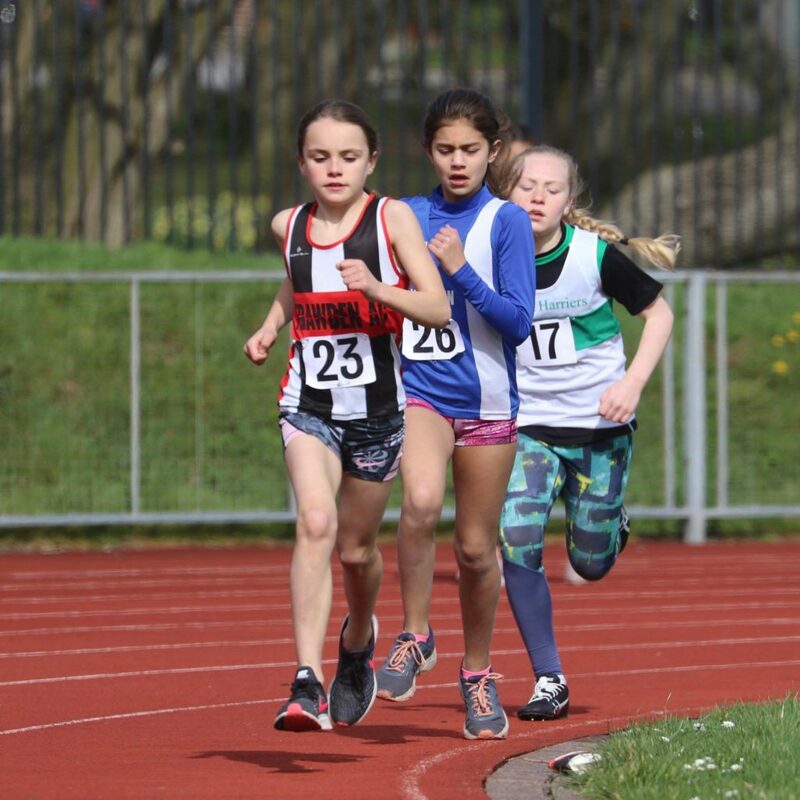 U13 Niamh Gater had a good day too at Trafford – her first track race of the season – as she clocked 11.7 to come home 2nd in the 75m before going on to jump to 3.61m in the Long Jump placing 6th out of 20 athletes in the event. 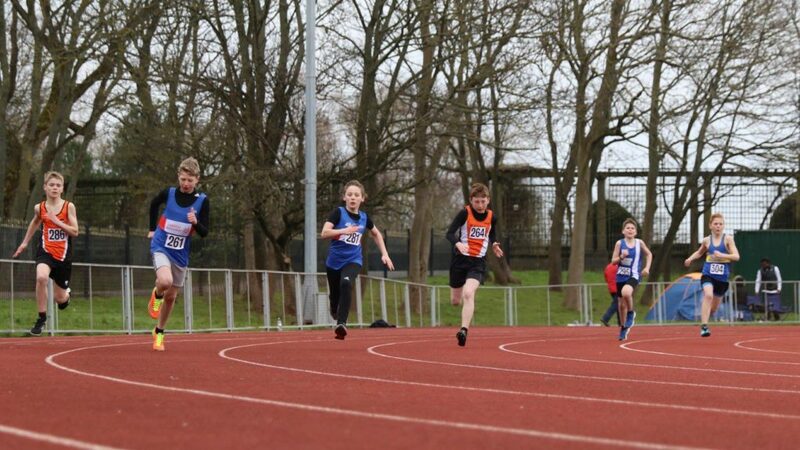 U13 Harrison Allcock also set a new PB in the 100m with his 3rd place time of 13.73 which bettered his previous personal best of 13.9. He then went onto race the 200m – a distance he hadn’t previously done – and won his Heat in a time of 28.56 which was the 2nd fastest time of the three Heats and followed that up setting a Shot Putt PB of 6.21m (7th), an improvement of 7 cms. Tony Balko (V50) was at his third Fixture in early season at Wakefield which wasn’t the best of weather for throwing where he won the Shot Putt with a distance of 10.48m and the Hammer with 37.29m as well as placing 2nd in the Discus with a throw of 34.31m. 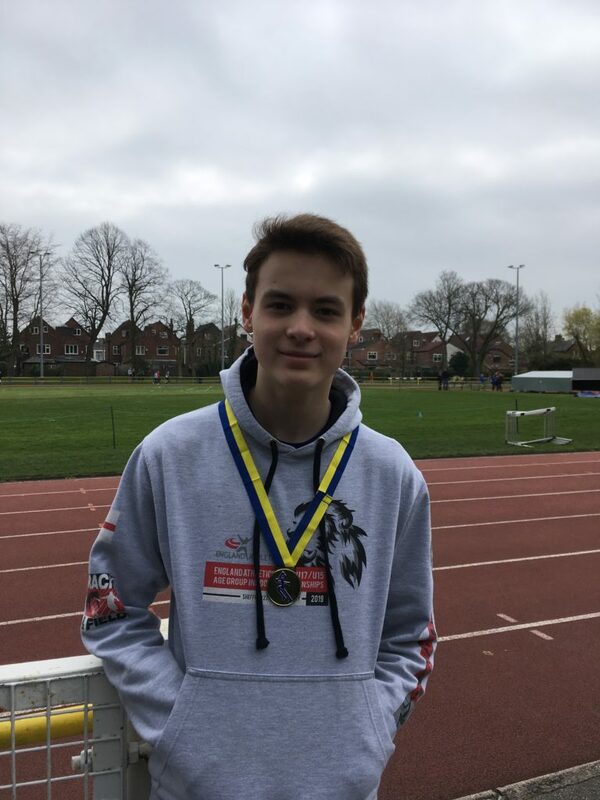 Matthew Heywood has moved up to U17 this year and finished 2nd in the Discus with 26.66m, won the Hammer with 45.55m and placed 2nd in the Shot Putt, throwing 8.30m which was a good solid opening to his forthcoming season in the UKYDL Upper Age Group. 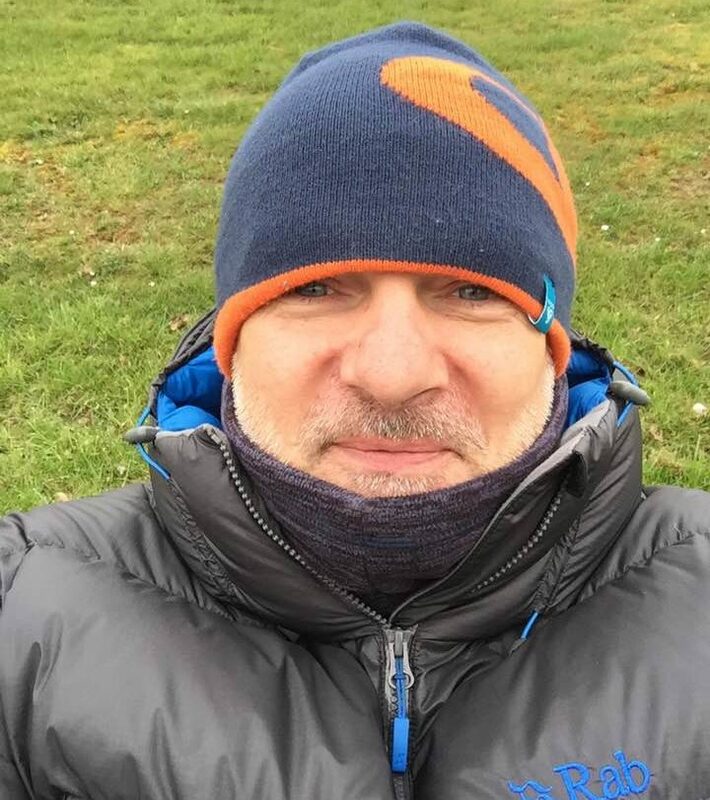 Tony Balko – trying to stay warm at Wakefield. Andrew Knowles – Junior Endurance Coach at Blackburn Harriers – is training for a Half-Ironman in Majorca later in May and as part of his training, he entered the Ulverston Triathlon at the weekend which consists of a 400m Swim, 28k Bike Ride and 5.8km Run – an event which featured two hundred and forty two finishers, won by Tom Rigby in 69.43. Andrew had a solid day coming home in 36th place with a combined time of 85.08 and told the Harriers “Having a ‘upset stomach’ all week put even starting in doubt, but I really needed to race with Majorca Half Iron Man 5 weeks away it was essential to test myself and equipment in race conditions, It’s been Two and a half years since my last triathlon, and there certainly were a few nerves, so a few deep breaths and here goes, exciting the swim in front of the super-fast ‘Tom Rigby’ (he started 15 seconds behind me) was a decent start. Out of the pool and running across the carpark ‘bare foot’ brought it all back, smooth transition and away on the bike, Tom flew past me like I was stood still, it was a tail wind out hitting 40mph a couple of times, it was a case of hold on tight! It’s an out and back bike course, so you can see athletes on the return journey into the headwind and it looked ‘grim’, so full concentration on the return pushing but not over cooking it. Off the bike onto the run, steady start and build was the aim, I felt strong thanks to chasing the Senior men on a Tuesday night all Winter. Result 36th from 180, in 1hr. 25mins, 7th Vet 50 from 48. 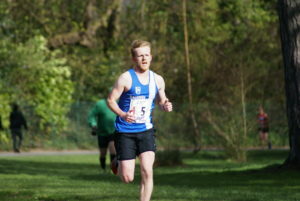 Winner Tom Rigby 1.09.43. 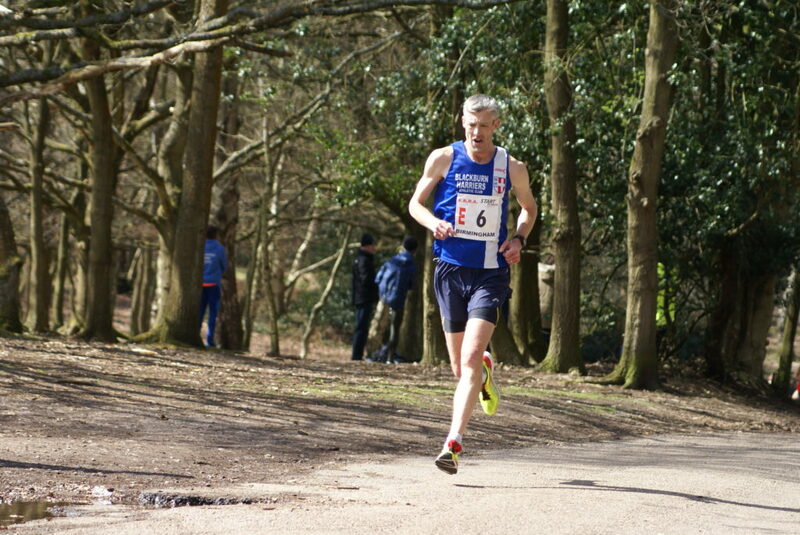 A couple of minutes adrift of the top few V50’s was a pleasing result”. 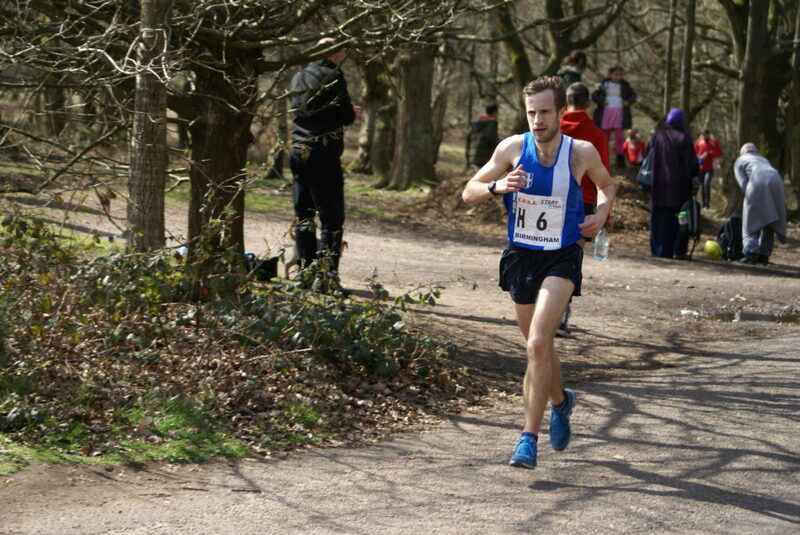 Well over three hunded runners in this race won by Shaun Heys in 38.46 on a course which was said to have a bit of everything and not the easiest. 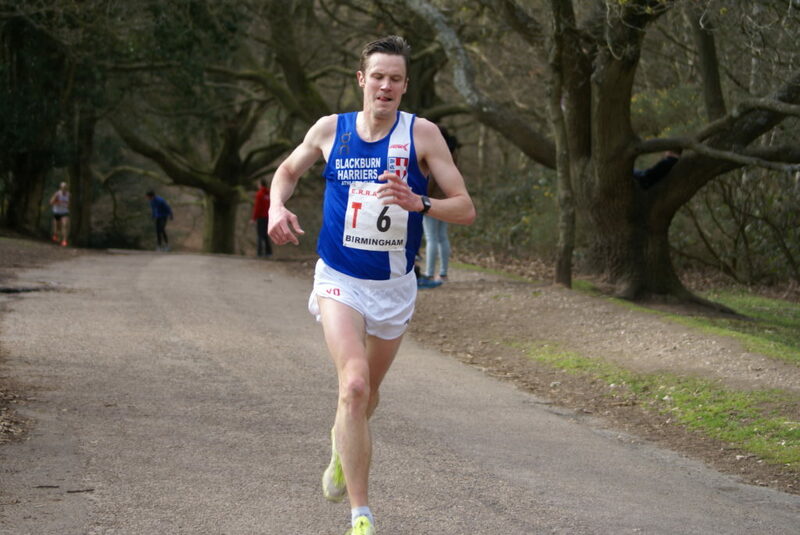 Blackburn Harriers Mark Wilkin ran this one placing 33rd overall and clocking 48.15, a run which earned him the 3rd V50 place out of thirty nine in the same age category. 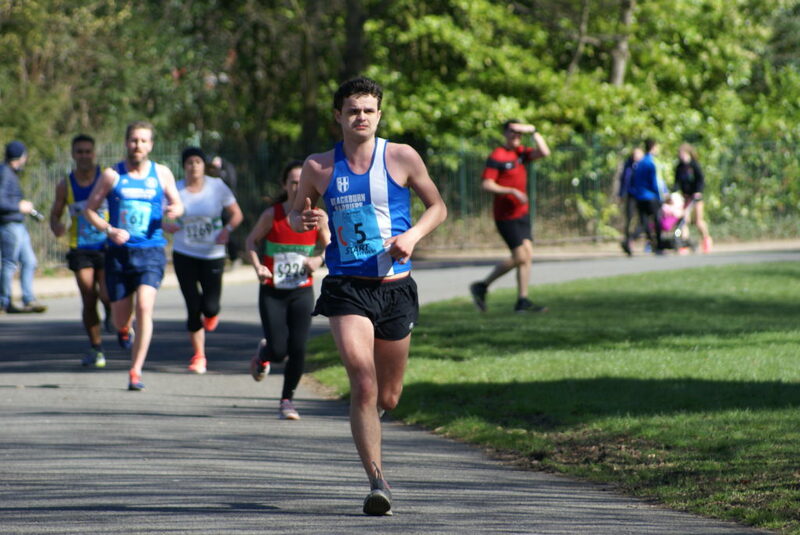 Great weather and setting for this years Road Relay National Championships and congratulations to Leeds City AC who were crowned National 12 & 6 Stage Champions for 2019. 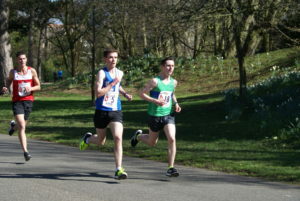 Paul clocked 17.42 followed by Chris Davies on Leg 5 who ran 29.33 for his long leg to bring us accross the line in 24th. Josh Holgate kept us there on Leg 6 with his 16.51, handing over to Tom Blaney on a long leg (7) coming home in 26th after a 29.59 clocking. 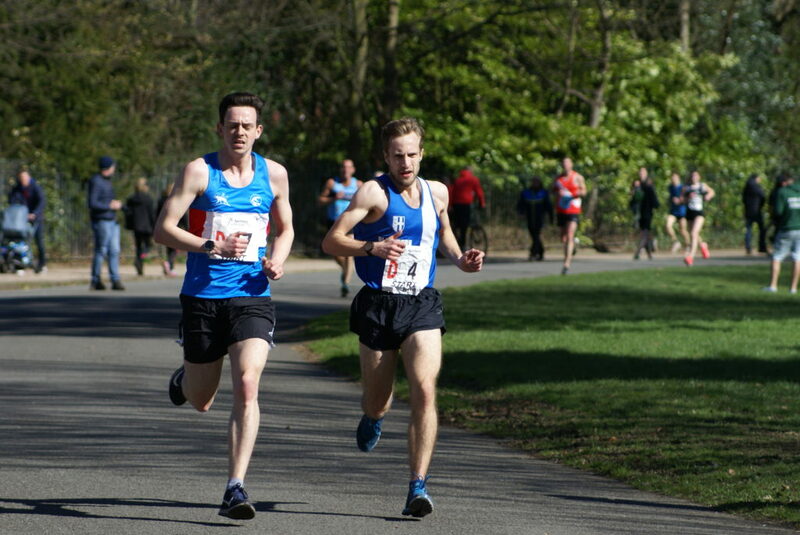 Jacob Watson ran a good short Leg 8 in 16.33 bringing the team back to 24th with Jack Hindle keeping us there with a good run on Leg 9 of 28.25. 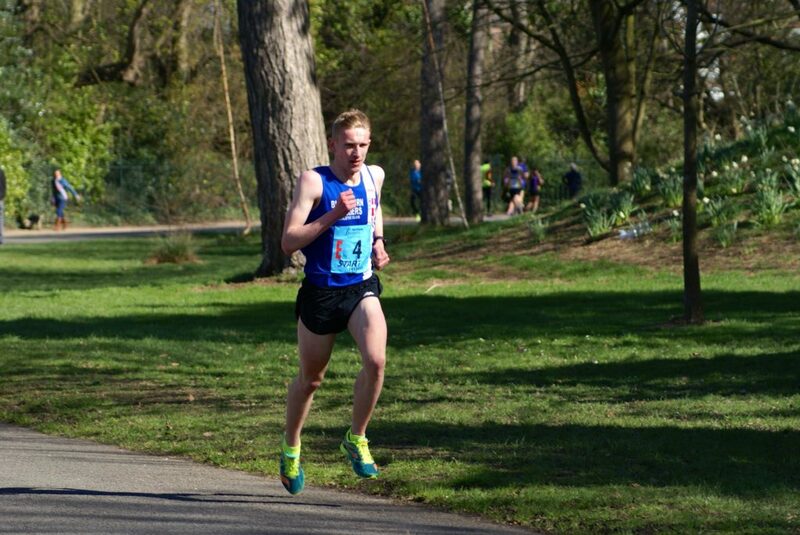 Ben Costello gained two places on Leg 10 – a short leg in which he ran 17.05 – bringing us back to 22nd. 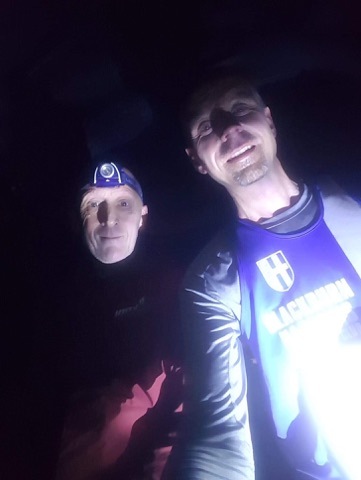 And talk about taking one for the team – Ben Fish ran a really tough one the last long leg becoming ill during the race which still saw him clock 27.38 to keep us in 22nd, handing over to Karl Billington on the last leg (17.24) which kept us in the same place. 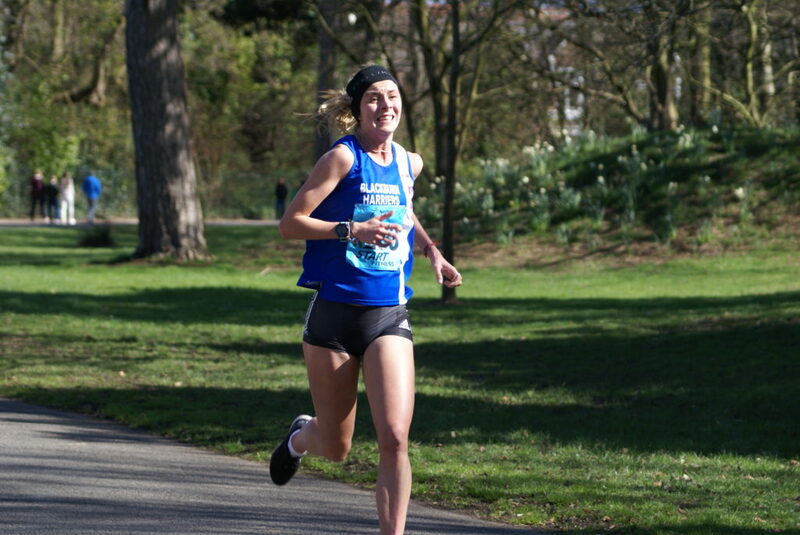 After running the fastest Long Leg at the Northern 6 Stage, two weeks ago and clocking a seasons track opener for the 3000m of 8.57.73 at Watford mid-week – (April 3rd) – there was more sensational running from Jess Judd who had a titanic battler with Anna Moller from Aldershot on the first leg of the Women’s 6 Stage with Moller coming out the winner in a time of 28.01 for the fastest Long Leg of the day with Jess in 2nd spot and the 2nd fastest Leg of the day in 28.07. 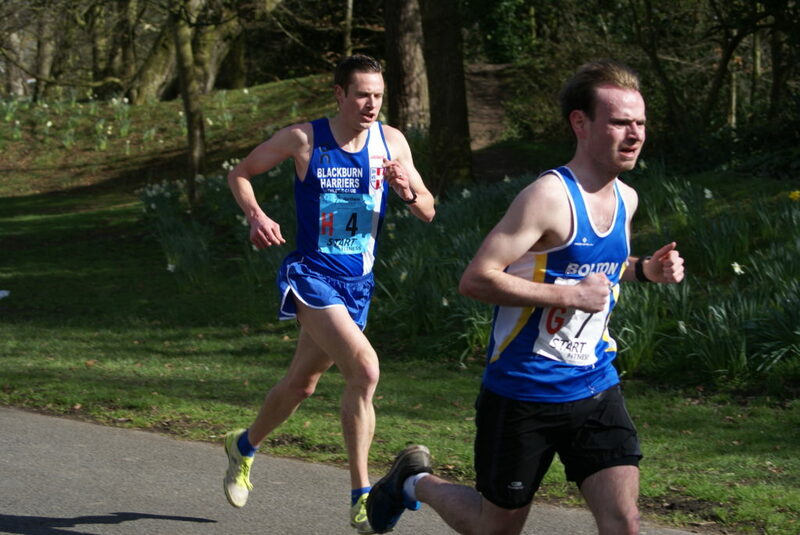 Unconfirmed reports suggested that both of these times had bettered the existing course record. 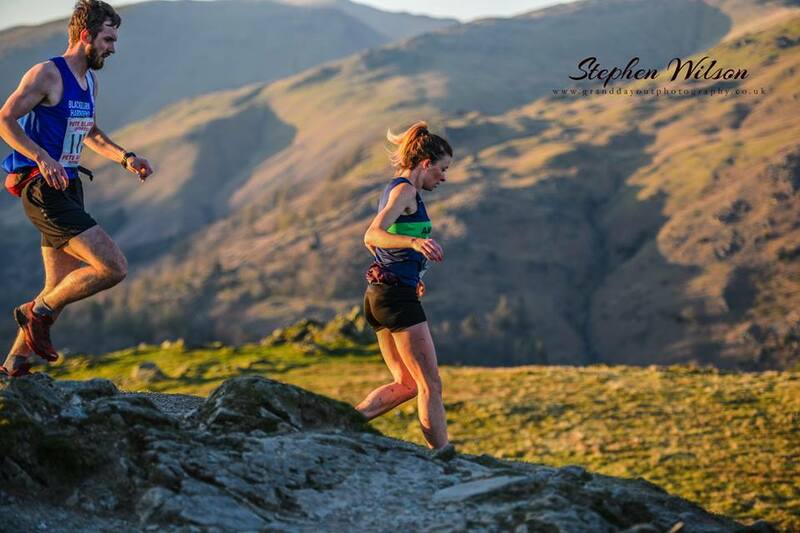 Unfortunately the Harriers had a part team in the 6 Stage which saw Jess hand over to Joanne Nelson on Leg 2 who ran a solid time of 20.45 to come back in 6th place, handing on toe Lindsay Davies on Leg 3 clocking 23.08 in 23rd. 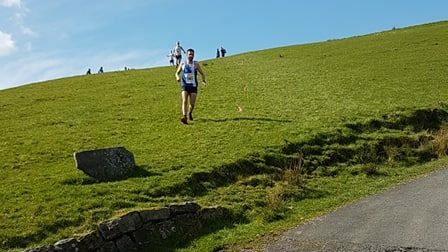 Not a bad day for the Harriers at this years Lancashire Fell Championships, held in the sun at Pendle and incorporated into the Pendle Fell Race. 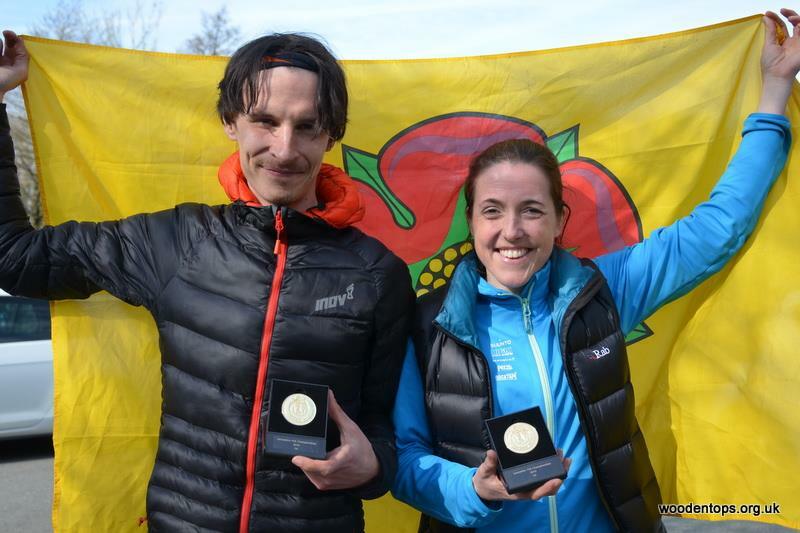 Two hundred and thirty two finished the Open Race won by Chris Houldsworth with Caitlin Rice being 1st Woman. 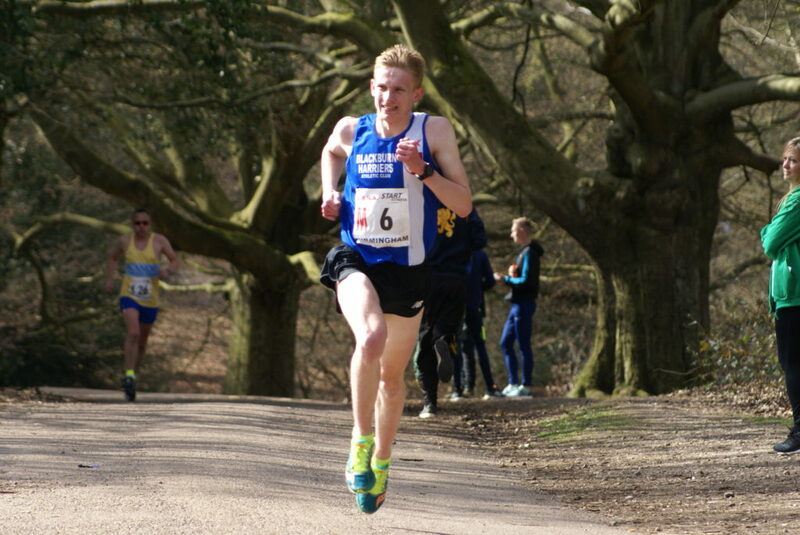 First home for the Harriers was Tom Marchant in a time of 35.47 in 12th place and 1st U23 Man. 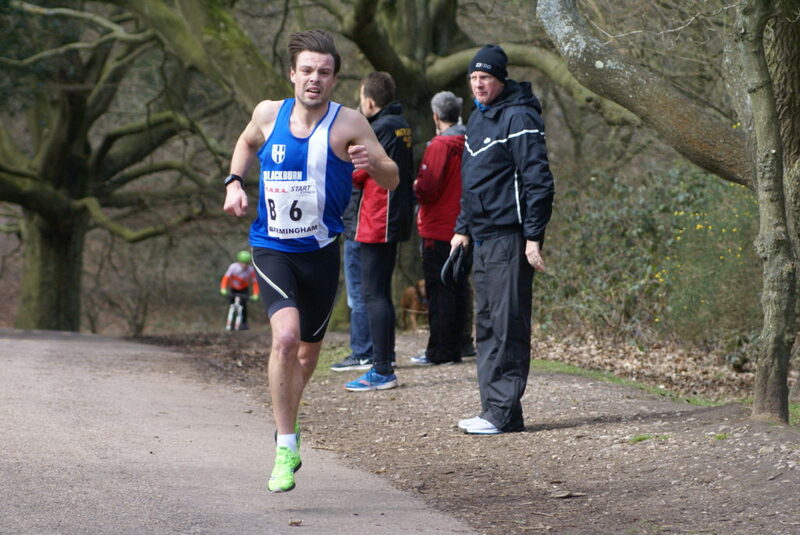 He was followed by John Horrocks just two places and 10 seconds further back in 14th with a time of 35.57. 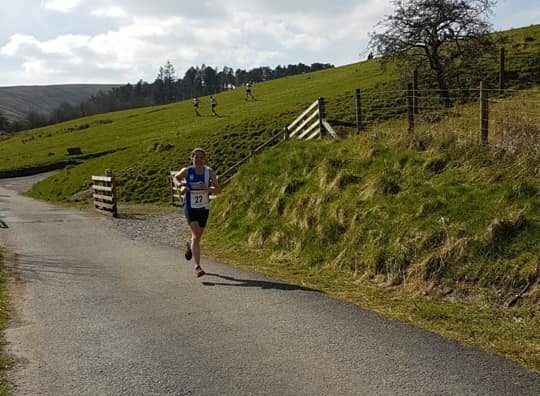 Victoria Mousley (39.06) had a very good day too as she came home 40th place overall – 4th woman and 1st in the Lancashire Championships which gave her the title for this year and qualifies her for the County at the Inter-Counties Championships in May. 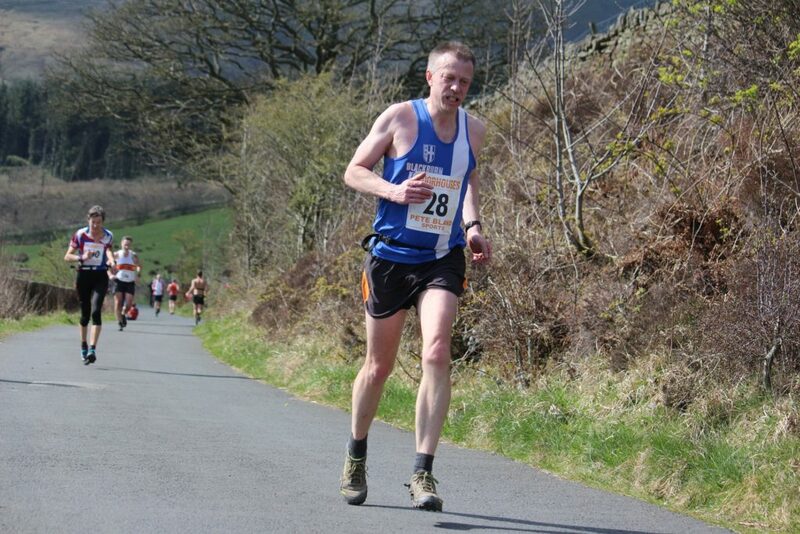 V50 Ian Clarkson ran a time of 47.59 in 133rd place as John Orrell – also a V50 – clocked 51.57 in 168th spot. 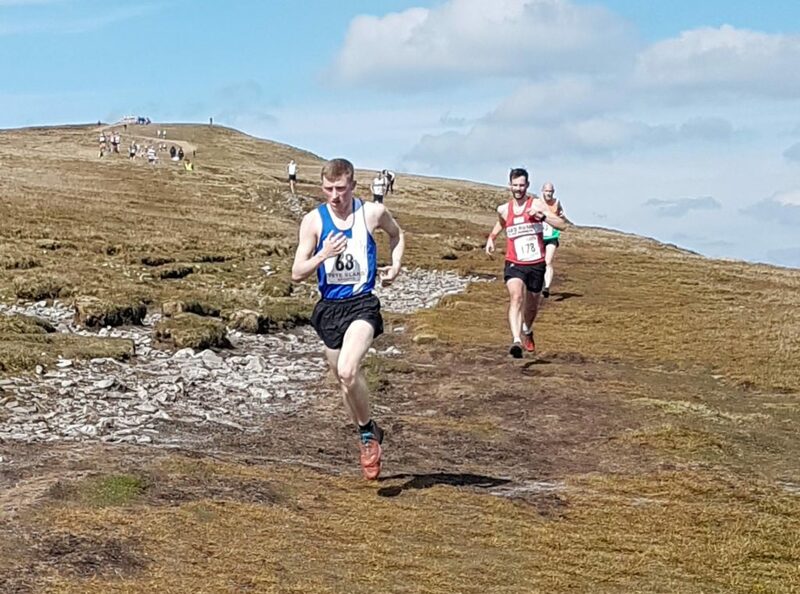 Following the Championships – John Orrell who is organising the Harriers own Pendle Fell Championships – commented “Most important after yesterday’s race on Pendle, we now have two County Champions! Well done to Victoria, Ladies Lancashire County Fell Champion 2019. 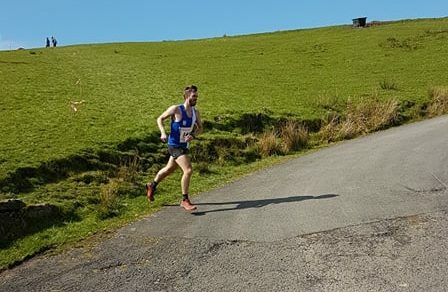 Well done to Tom, Under 23 Mens Lancashire County Fell Champion 2019. 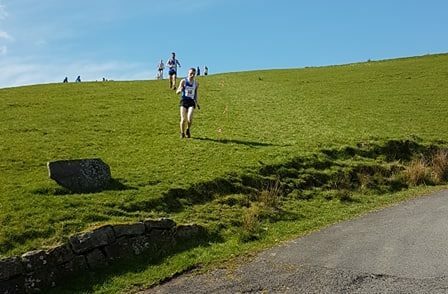 In our Fell Champs, topping the leaderboard on 3 races is Ian Clarkson Followed by and on 2 races are: John Horrocks; Victoria Mousley; Danny Teare – and on one race – Thomas Marchant; John Orrell; Gary Pearse; Craig Greenough; Matt Nuttall. 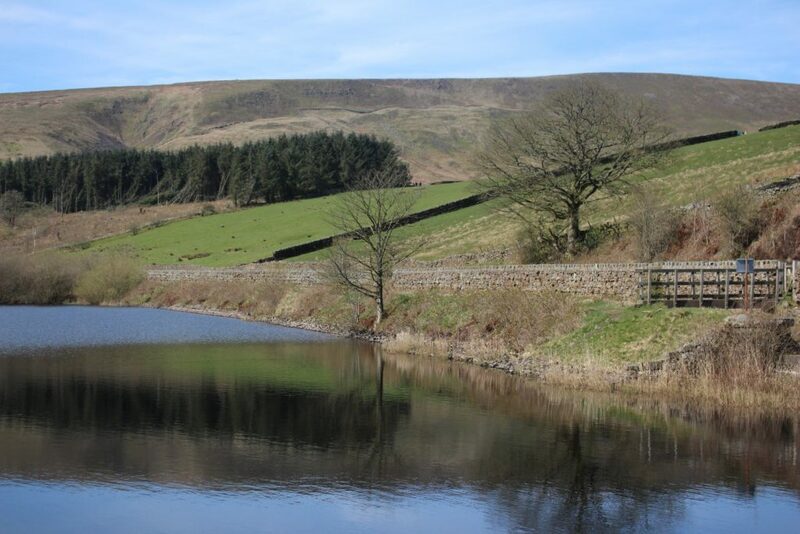 Next race is Pendle Cloughs. Our first long race. Get your map and compass out for that. May 11th. Closely followed by our 2nd nightr ace Mearly Clough. No torches needed this time. May 14th. 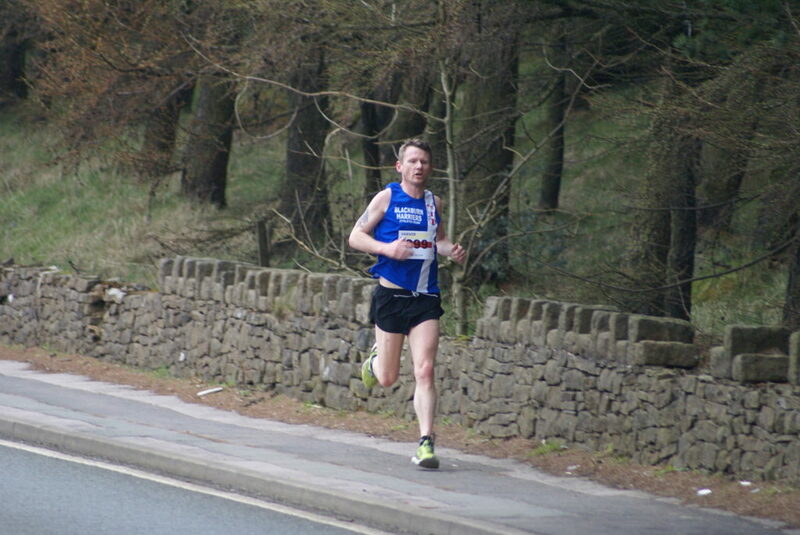 Keep on running, Thanks for your support at Pendle, Helen, Damian, Poppy the dog, Danny T and Richard team photographer”. 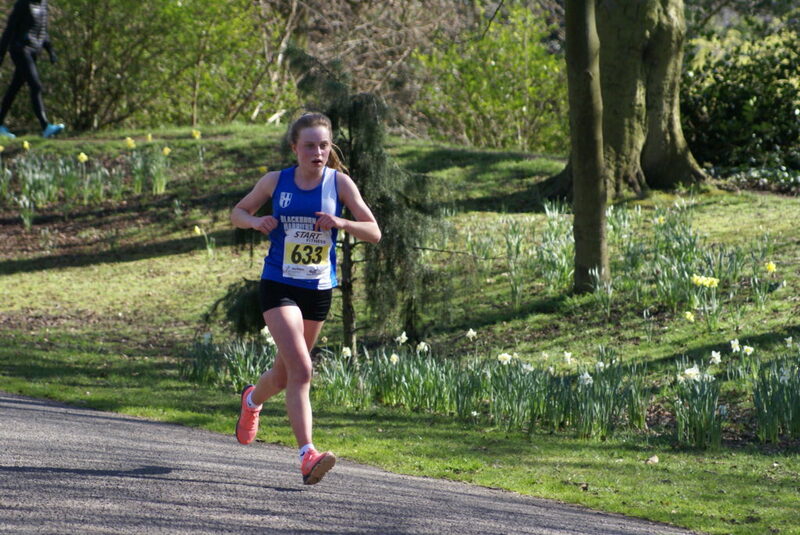 There were Junior Races too on the day covering U9 – U11 – U13 – U15 – U17 age categories. 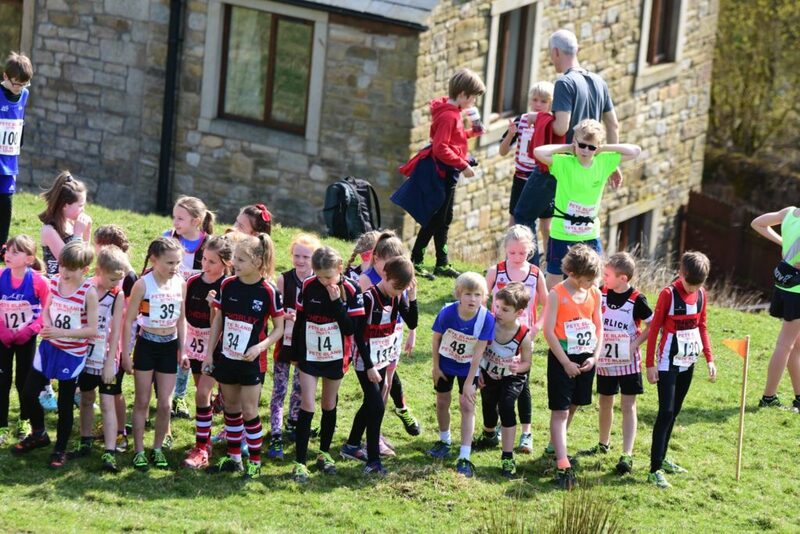 Fifty two youngsters went in the U11 Race won by Charlie Robinson (Bingley) in a time of 4.28. Theo Robinson had a very good run as he placed 8th overall with a time of 4.51 with new member Harmony Hacking in 27th overall and 8th girl out 25 running in a time of 5.35. 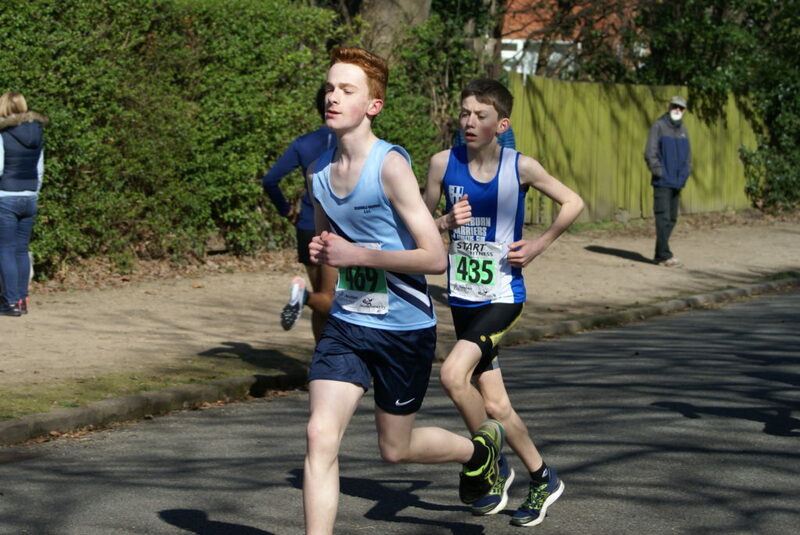 The U13 Race featured 67 runners and was won by Archie Peaker in 13.07. Matthew Smith had another good run for this talented young athlete who seems to be at home both on the track, in cross country and fell. Matthew came home in 11th position with a time of 15.08. 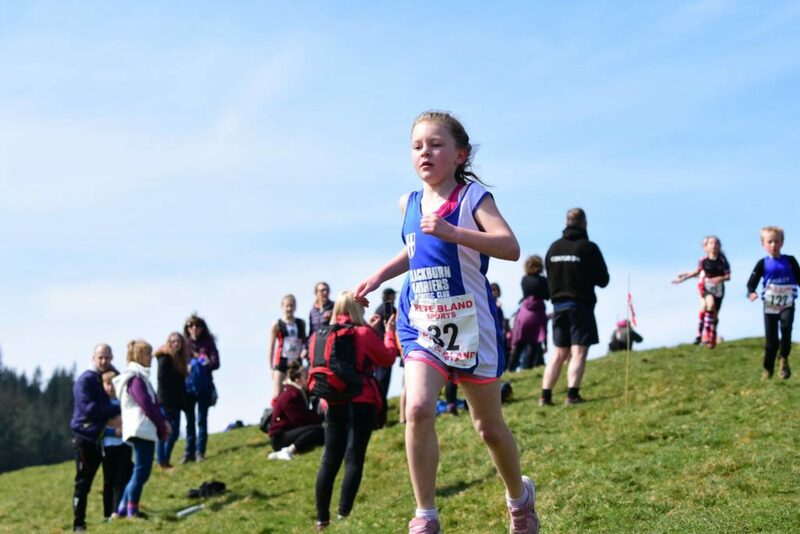 Imogen Robinson finished in 41st overall and 7th girl out of 24 clocking 17.28. 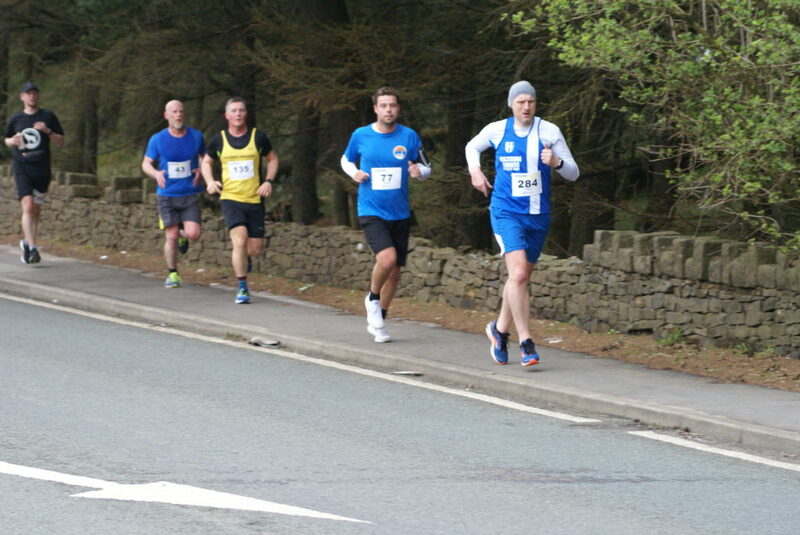 Smaller field than last year numbering 267 runners as they set off from Darwen Academy, up Redearth Road and Watery Lane and heading out towards Entwistle and being lead out by Blackburn Harriers Jacob Watson. 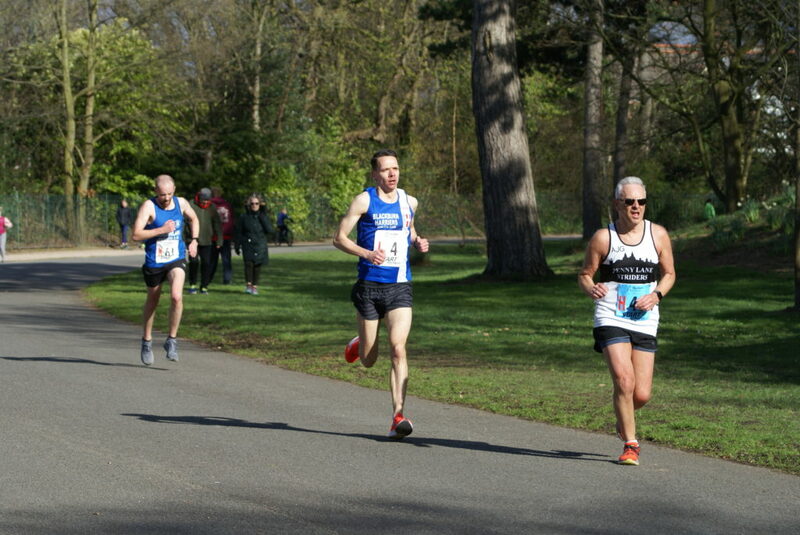 Four Blackburn Harriers ran the race – Jacob Watson, Paul Brindle, Joanne Nelson and Paul Whittaker – Jacob, Paul and Joanne having all run the National Road Realys the day before at Sutton Coldfield. 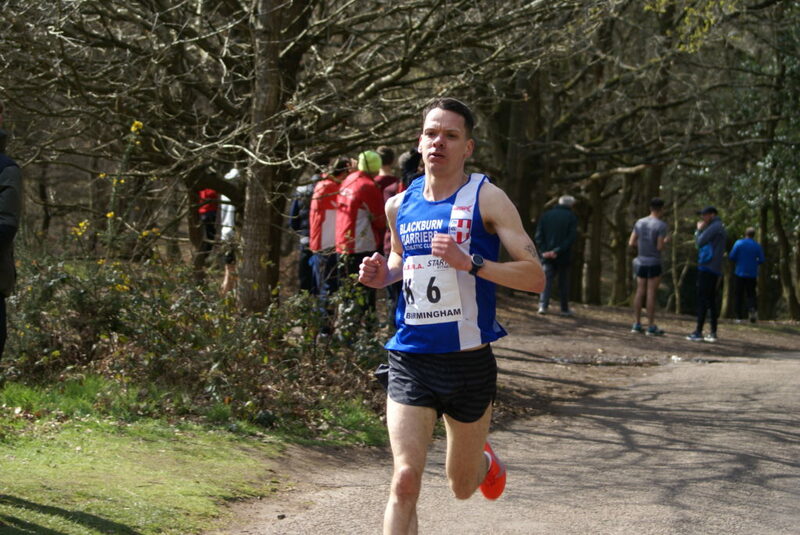 Paul Brindle made in two Harriers home in the first four places as he came across the finish line in 4th place clocking 81.51and commented after the race that “After finding some form and having a good run at the Nationals 12 stage. 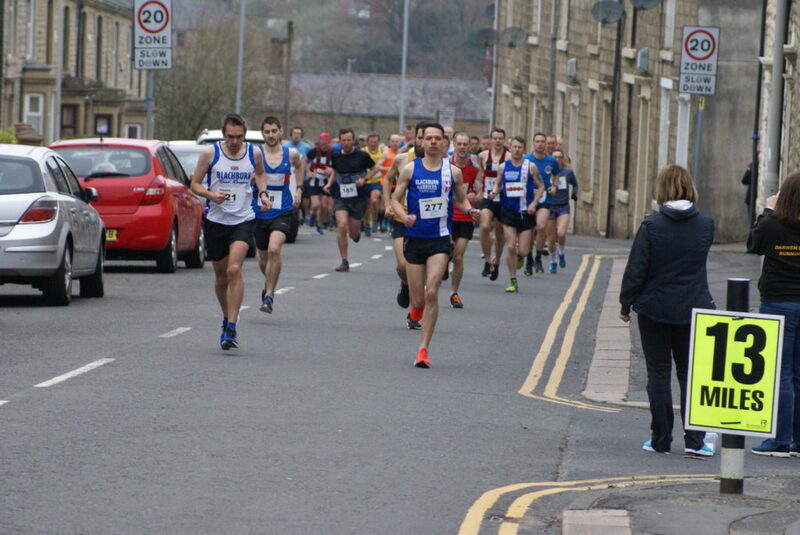 Joanne Nelson slipped a mention of Darwen half after a couple of beers. After the third the legs felt great and I was up for it. It’s a two minute drive to the start line, you couldn’t really say no. Got to support local races. Had a good run in great conditions on a hard course. Managed to better my last race on this course so happy and a 4th place on the day”. Joanne Nelson finished 19th overall and 2nd Woman posting a time of 1hr 33.47 as she moved through the field, stronger in the second half of the race. 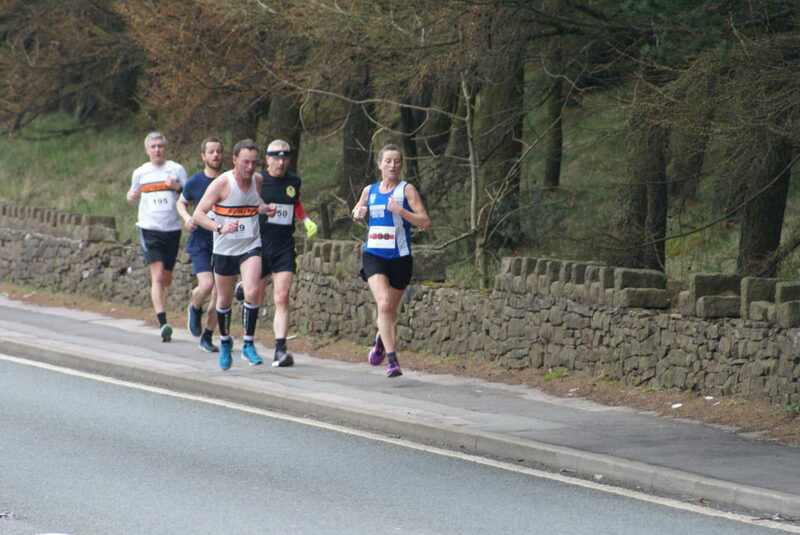 Joanne told us that it was “First time for me in the Darwen half and I really enjoyed it. I can’t really complain with 2nd female, especially after the National’s the day before, however there is much room for improvement. A great event, with something for everyone”. 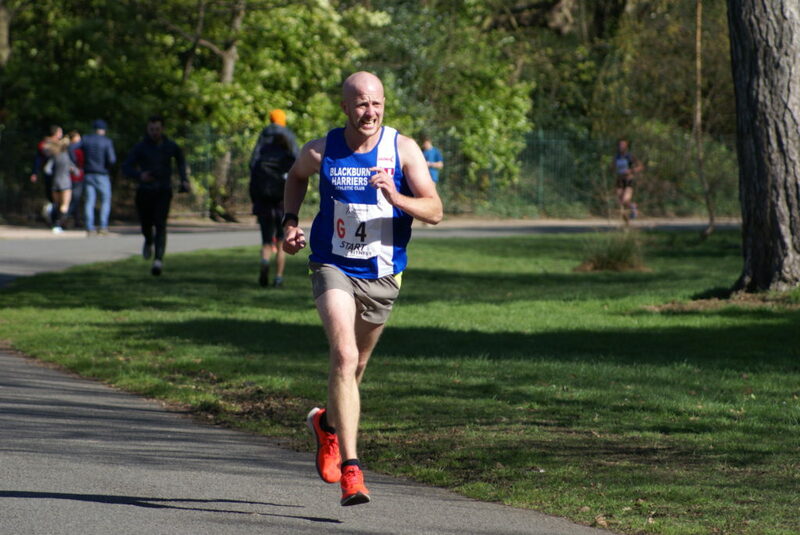 Paul Whittaker was tackling his first half-marathon which wasn’t the easiest one to make your debut on but did really well in running a time of 1hr 49.03 in 92nd spot. 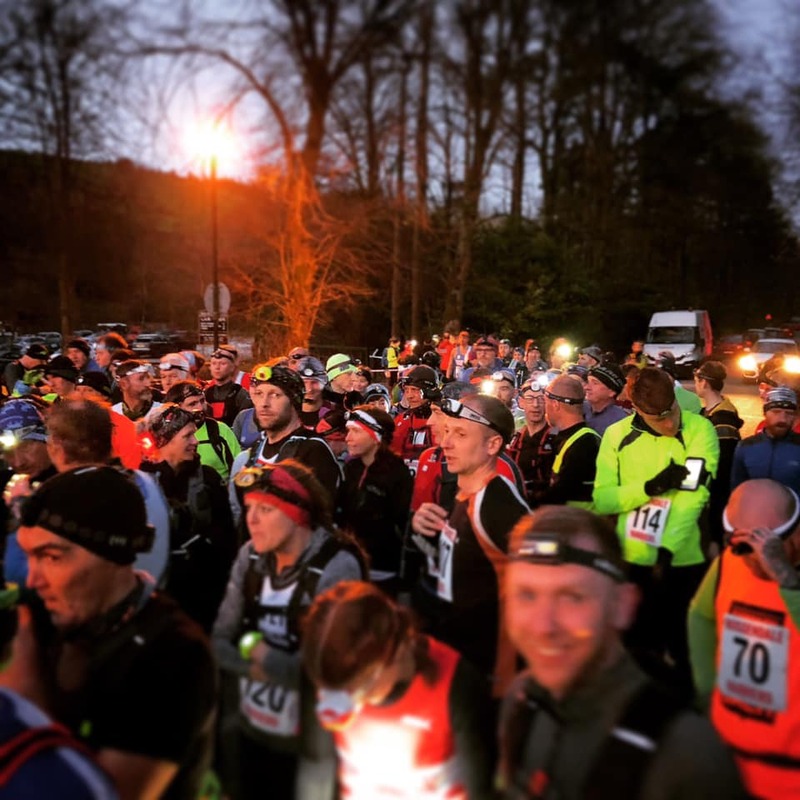 Race 2 was the Pendle Night Race organised by Rossendale and Pendle Mountain Rescue Team held on Thursday March 28th featuring Harriers in the 121 strong field – Victoria Mousley, Danny Teare and Ian Clarkson. 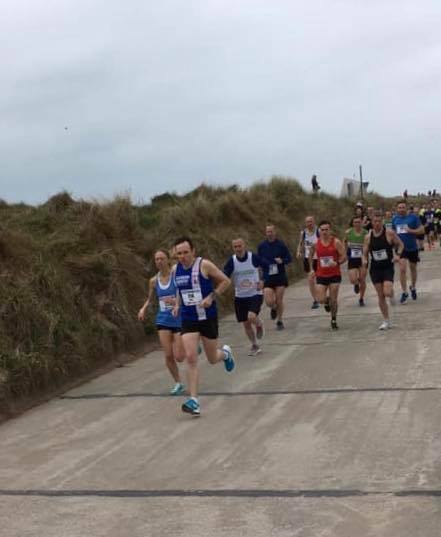 Victoria was the first across the finishing line in a time of 47.56 in 14th place overall and 1st Woman, followed by Ian in 47th spot clocking 58.33 and Danny (69th) running 64.57. Tony Balko got in some pre season practice by travelling over to Spenborough for their Open Meeting where he took on the Hammer (6kg) and Shot Putt (6kg). Throwing the 6kg weight, Tony set nhimself a new PB in the Shot as he won the event with a throw of 11.08m which bettered his previous best set in 2018 of 10.91m. 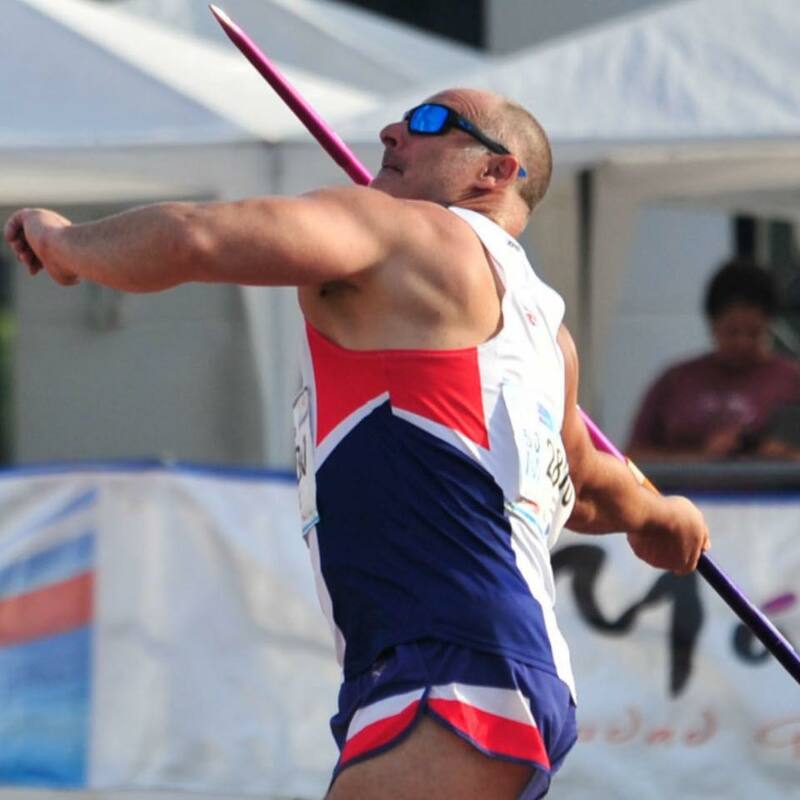 He then went on to make it a double win on the day in the Hammer with a throw of 37.83m – his previous best here being 39.45m which won him the Northern Masters Championships in 2018. 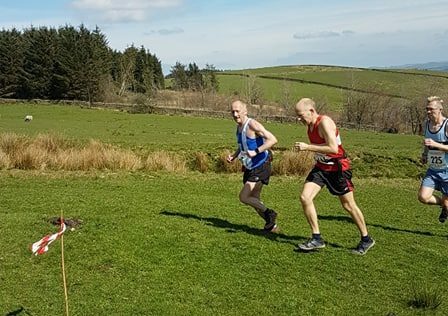 One hundred and thirty one runners finished this race won by Paul Wearden in 1hr 26.29 which presumably was the time for the 9 mile course. 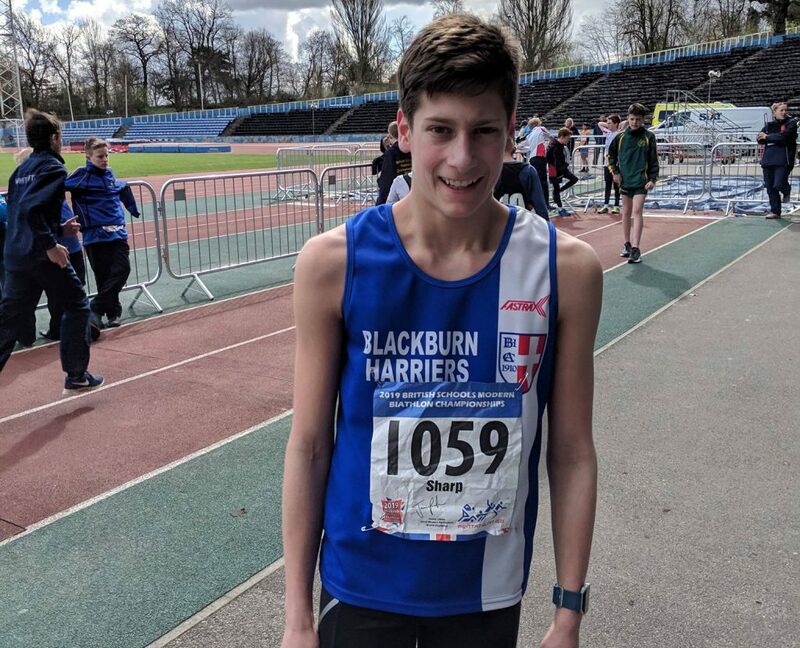 Blackburn Harrier – Sam McCreadie – who is training for the London Marathon, decided to do the 17 mile course and clocked a time of 3hr 13.04. Afterwards she spoke to the Harriers about it saying “just did it as a long training run (and to give my shins/feet a break from the road). It wasn’t particularly quick especially with the stopping to climb over styles/gates/fences (and to map read!). Not sure it’s converted me from road running but a nice change and a good 18mile run done”. 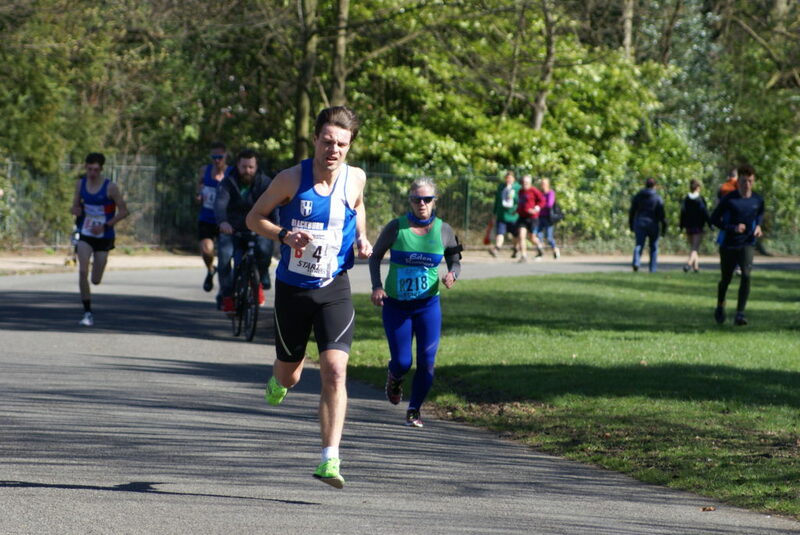 A fine but windy day greeted the athletes for this years Northern 12 & 6 Stage Road Relays at what has become a very popular venue for the event. Closed roads and a scenic route help to add to the attractiveness of the races too. Run way winners by over five minutes of the Men’s 12 Stage were Leeds with an accumulated time of 3hr 06.43 with City of Sheffield in 2nd place and Salford in 3rd. 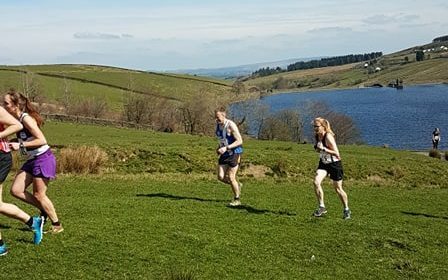 Blackburn Harriers had two teams out with the ‘A’ team placing 6th overall and the ‘B’ team 38th out of the sixty four complete teams contesting and in the Women’s 6 Stage, Rotherham pipped leeds on the final Leg to take the title. 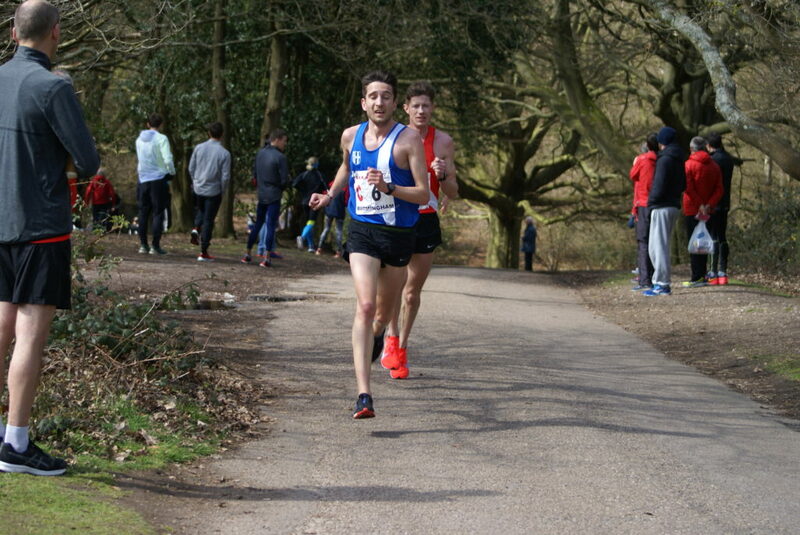 Men’s Team Manager – Paul Guinan – was really pleased with the performances of his Teams and told the Harriers “What a fantastic day at the 12 Stage Road Relays both teams running hard and getting great results. A special day for the A Team finishing 6th and equalling the position we had in the early 2000s it has taken some time but I believe now we are ready to move on again and finish in the top 5 in the next year or so, the team spirit and cohesion is all there to see, we have built this up over the last couple of years and now really making our mark both locally and nationally, a big thanks to the athletes who train extremely hard, push boundaries and keep on looking forward. Big thanks to John Chaplin and Ben Fish for supporting me in my role as Team Manager, once again the future is bright with no doubt some big results to come”. The ‘A’ team started off in 7th spot, getting to 5th on Leg 4 before holding onto 6th place for the last six Legs. 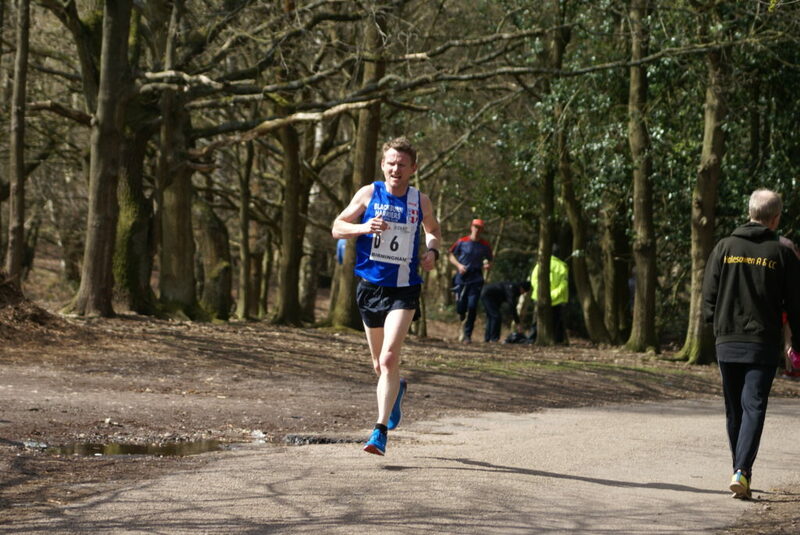 Great consistency throughout the team, both th in the Long and Short Legs. 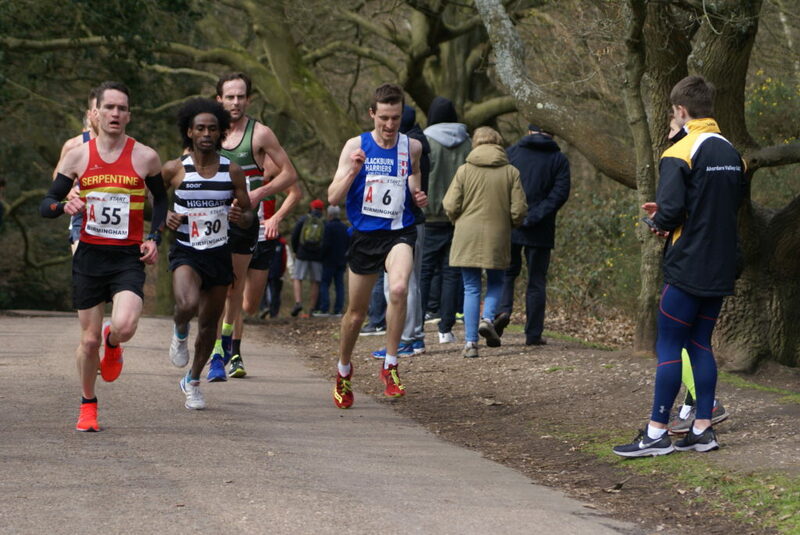 Tim Raynes ran a grerat first Leg clocking 23.47 with Rob Warner on Leg 3 running a time of 23.54, Jack Hindle on Leg 5 (24.53) and Ben Fish with the fastest Long Leg, clocking 23.44. 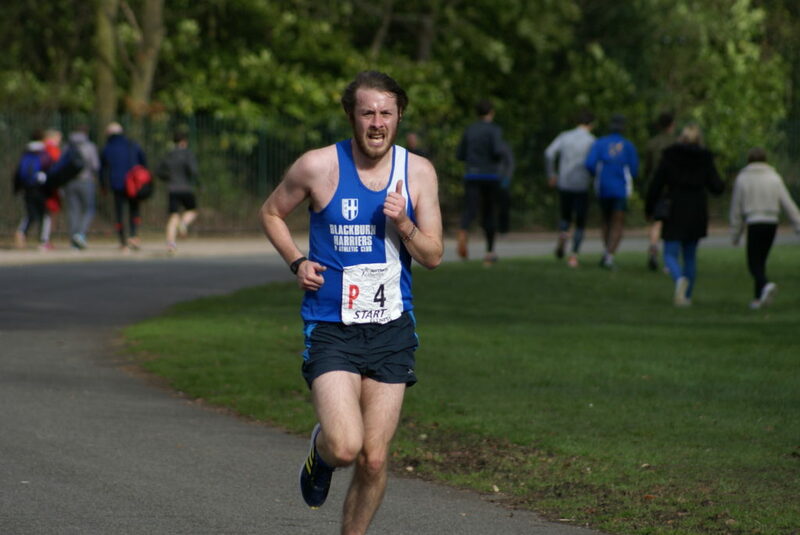 The Short Legs saw Marc Hartley run 11.54 on leg 2 – the fastest Short Leg for the team, backed up by Josh Holgate Leg 4 in 12.09, Ben Costello Leg 6 (12.36), Tom Blaney Leg 8 (12.32), Tom Marchant Leg 9 (12.29), Jacob Watson Leg 10 (12.13), Chris Davies Leg 11 (12.33) and Karl Billington on Leg 12 (12.52). Similar consistency too in the ‘B’ Team with Long Leg times. 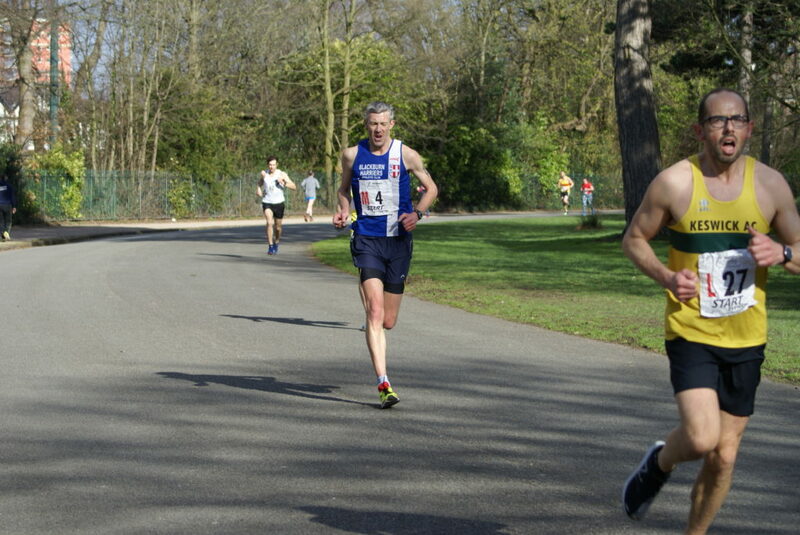 Paul Brindle ran the fastest on Leg 1 with a time of 26.28, backed up by Joe Howe on Leg 3 (27.01), Calum Holmes Leg 5 (27.41) and Paul Guinan on Leg 7 (28.16). 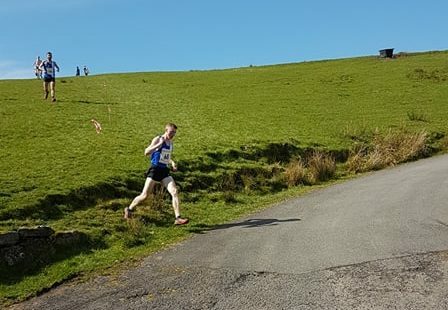 Danny Maynard ran the first short Leg 2 clocking 13.54 followed by Joe Gebbie with the fastest short leg of the ‘B’ team – Leg 4 (12.45), John Cookson Leg 6 (15.35), Matthew Poole Leg 8 (14.42), Paul Jeffries Leg 9 (15.01), John Chaplin Leg 10 (14.46), Mark Almond Leg 11 (14.03) and John Foster Leg 12 (14.21). Unfortunately we weren’t able to be able to field a full Senior Women’s team but that didn’t stop Jess Judd having a blinding run on the first leg as she clocked the fastest Long Leg of the day in the 6 Stage with a time of 25.43 – over half a minute in front of the 2nd placed Claire Duck from Leeds (26.21). 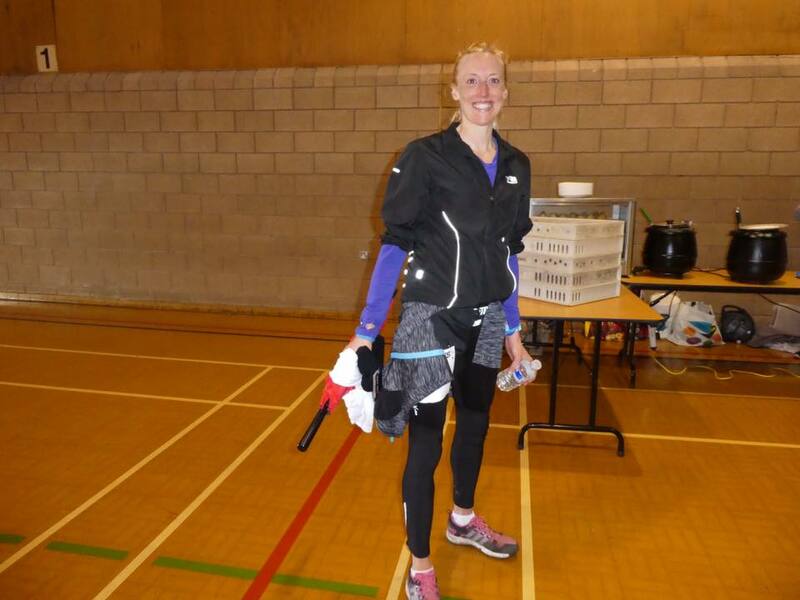 Joanne Nelson took over on Leg 2 which was a short leg and ran good time of 15.11 to hand over to Lindsay Davies on leg 3 in 3rd place – Lindsay clocking a solid time of 16.57. Four races in the U15 and U17 championships with 44 athletes in the U17 Men; 20 in the U17 Women; 58 in the U15 Boys and 51 in the U15 Girls. 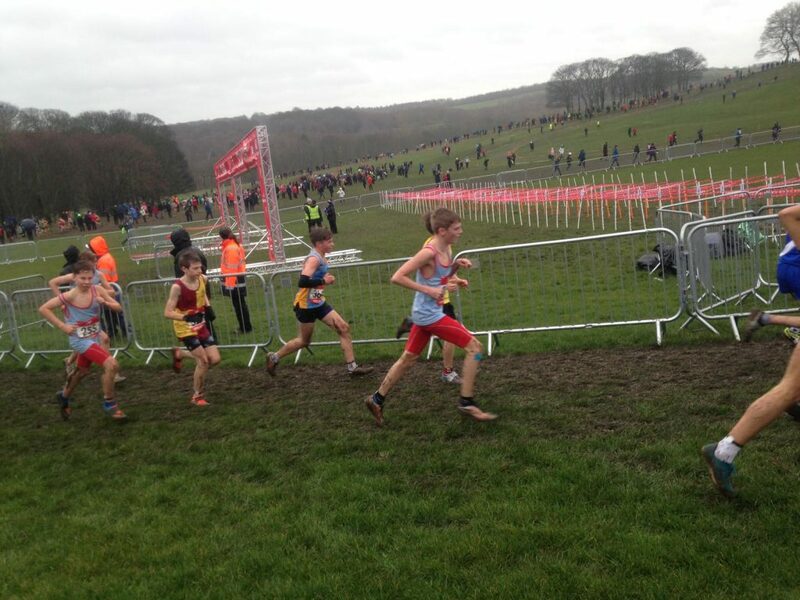 Sam Hodkinson placed 35th (18.17) in the U17 Men’s Race with Jamie Teare in 36th (18.23) and Harry Wilkin running 19.22 (43rd). 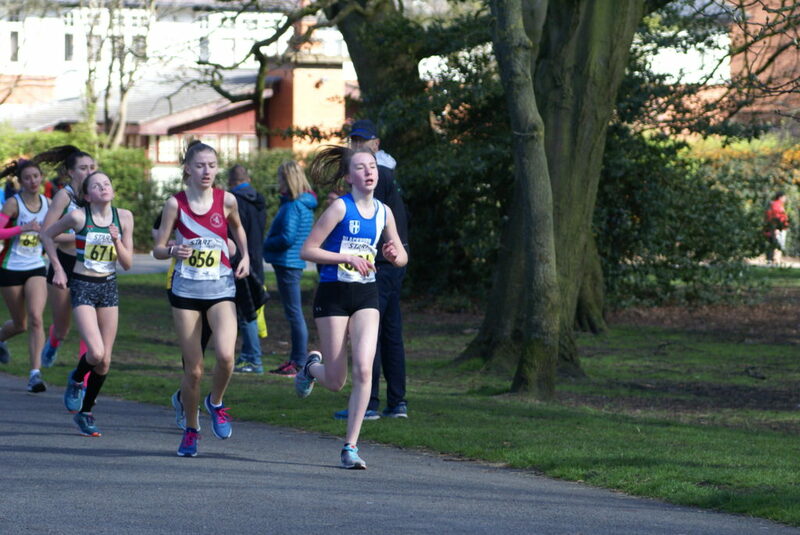 Amy Davies came home in 10th spot in the U17 Women’s race clocking 20.18. 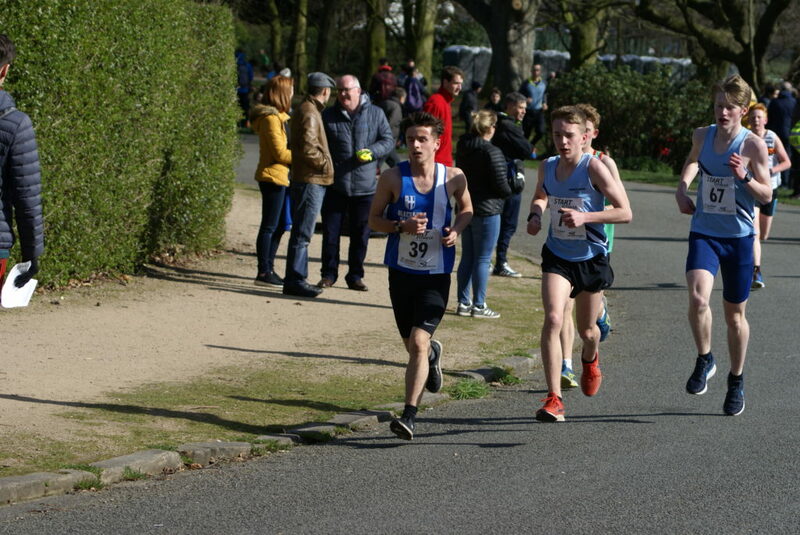 Kyle Taylor-Pomfret ran a time of 19.03 (42nd) in the U15 Boys race with Rory Teare in 53rd (20.36) and Sebastian Burton (56th) in a time of 21.13. 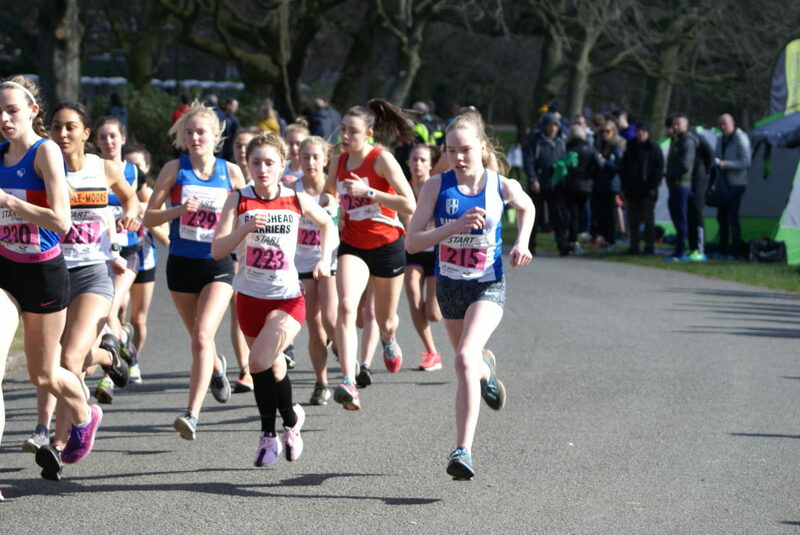 The U15 Girls had Leah Hoole coming home in 26th postion in a time of 20.49 with Hollie Cubbon just behind in 29th place (21.14) and Rebecca Ramsden clocking 23.22 in 46th spot. 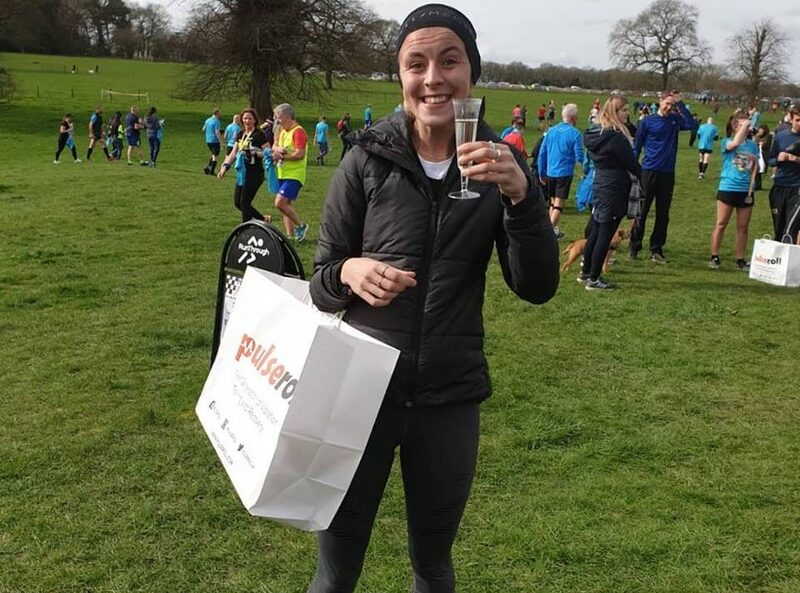 What a start to the weekend for Jess Judd and Rob Warner at this 10k race run at Arley Hall featuring over 1200 finishers and won overall by Mohammad Abu Rezeq in 29.21. 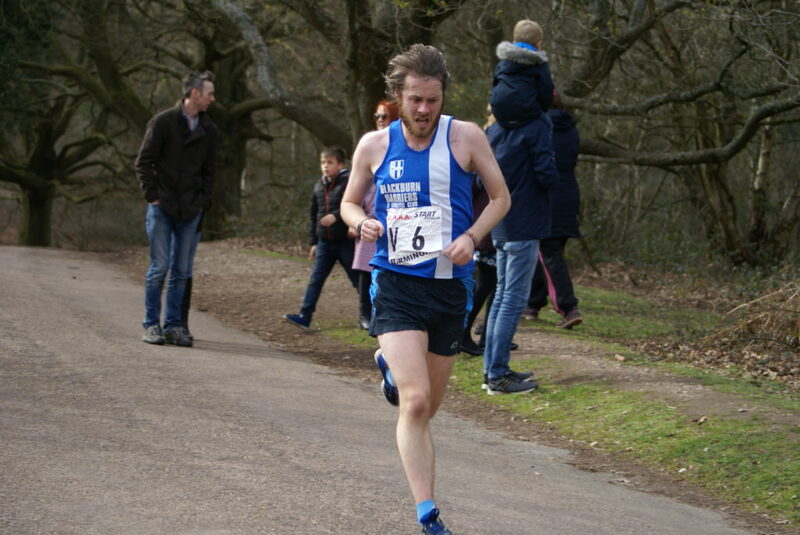 Rob had a great run too as he placed 4th in a new PB time of 30.17 – 25 seconds faster than his previous best et at the RV10k held in December 2018. 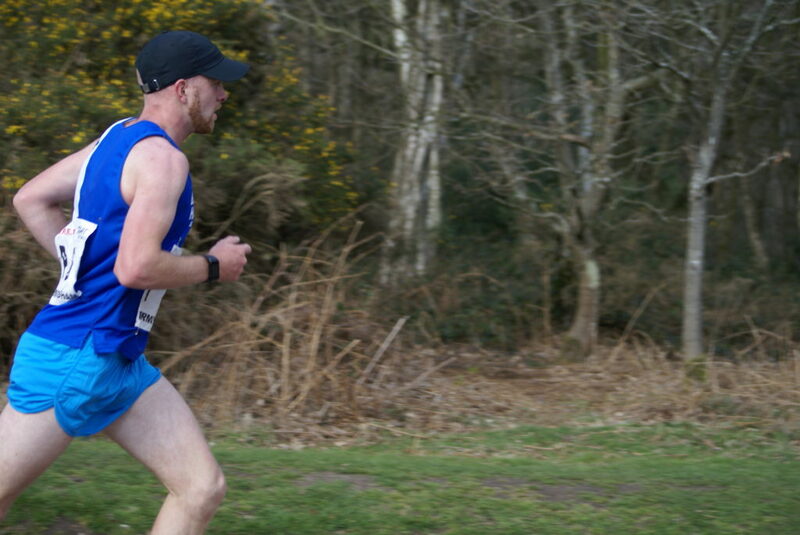 After the Race, Rob commented to the Club that “After a bad run at inter counties it was good to get a good run in today! Was hoping to try and get towards 30:30 so really happy to get a long way under it! Hopefully it will translate onto the track now”. Jess Judd with champers & prizes. 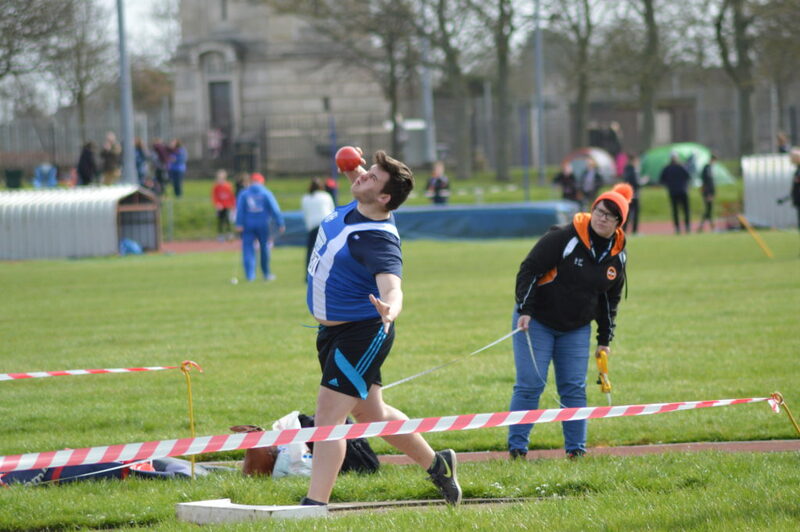 The traditional Open Meeting at Stanley Park took place at the weekend and saw a fabulous start to the new season for U20 Thrower – Anthony Kent. 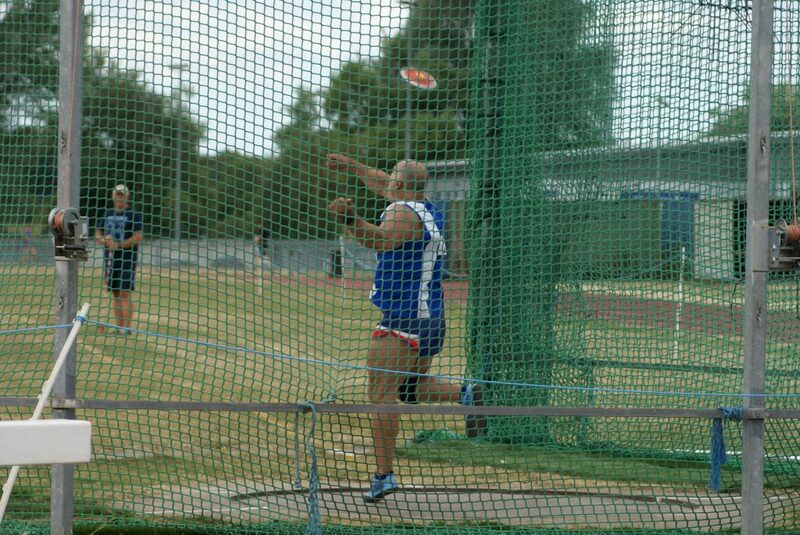 In the Discus he threw a new PB of 46.89m and a new Club Record to win the event and an improvement of close to seven metres! Similarly in the Shot where he won the event with a new PB throw of 12.83m just over a metre improvement on his previous best, breaking the existing Club Record which belonged to him. 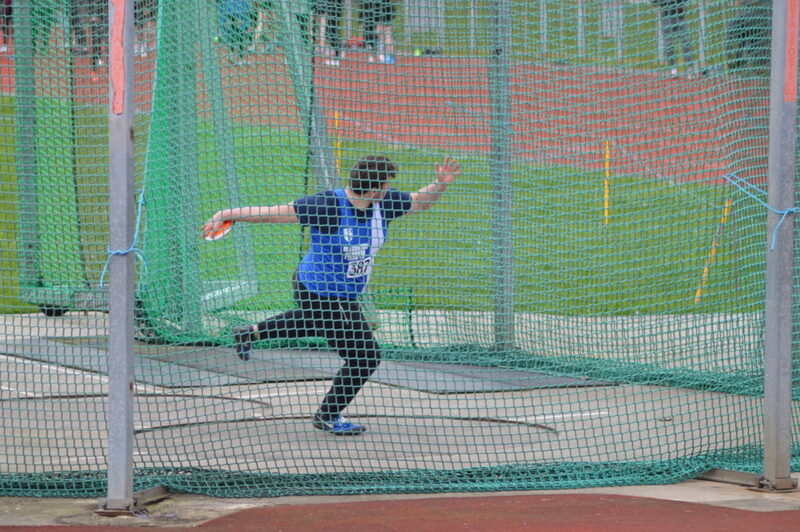 U17 Matt Heywood was in very good form in the Throws setting a new PB in the 1.5kg Discus throwing 29.26m – a new PB by 6m and followed that up with a new PB of 5m as he finished 2nd in the 5kg Hammer with a throw of 46.08m finishing the day off with his first attempt at the 5kg Shot where he placed 4th (8.48m). 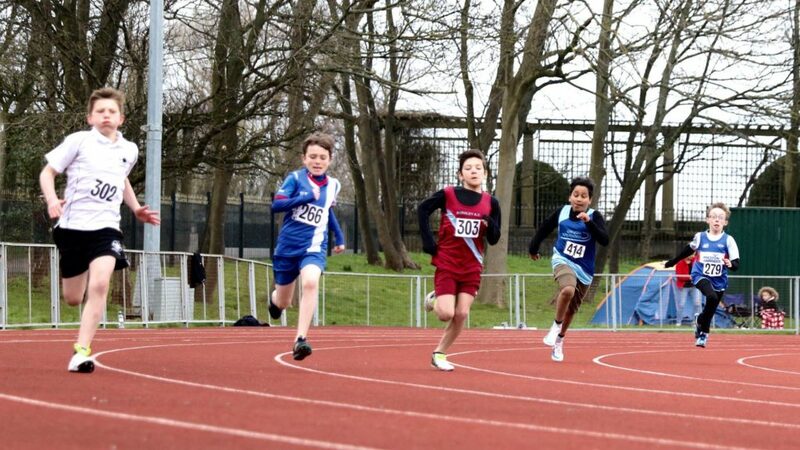 Many of the youngsters at the fixture today were competing for the first time in Track & Field and in some cases, for the first time in their event. 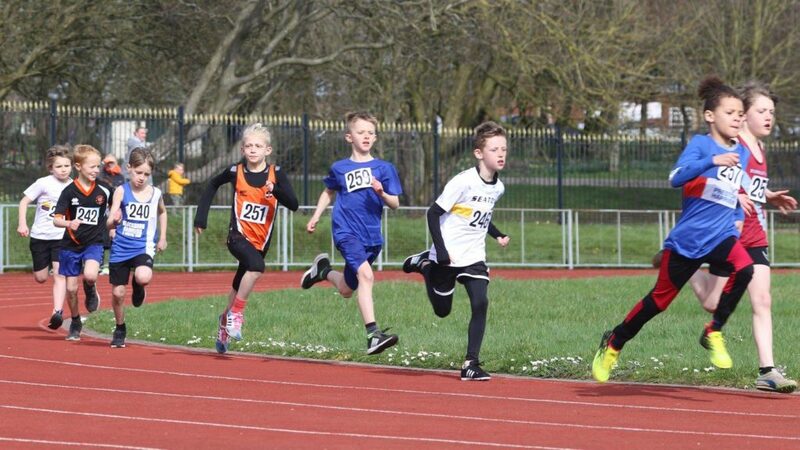 Charlotte Smith and Alex McKinlay entered the U9 competitions and did really well with Charlotte winning the 80m in a time of 13.9 coming 5th in the 600m 2.20.4 and 2nd in the Long Jump with a leap of 2.63m – Alex placed 3rd in the 80m in a time of 14.2 and 4th in the 600m in 2.19.9. 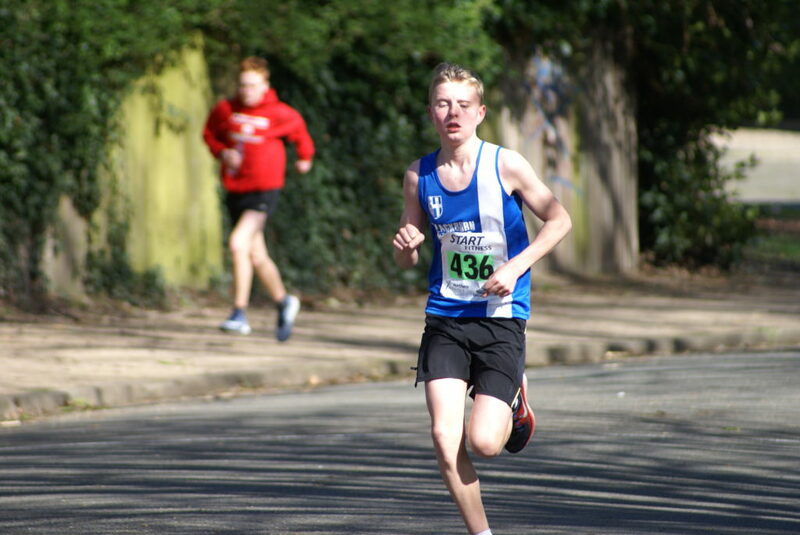 There were some outstanding performances by the young athletes too and none more so than by bottom of age U13 Matthew Smith who entered three events and won them all. He won the 800m, a distance he has never raced before in a time of 2.31.4 and followed that up by winning the High Jump with a clearance of 1.50m – a new PB by 7cm and a win in the Long Jump, leaping out to 4.41m – a new PB by over half a metre putting him at number 16 in the National Rankings. 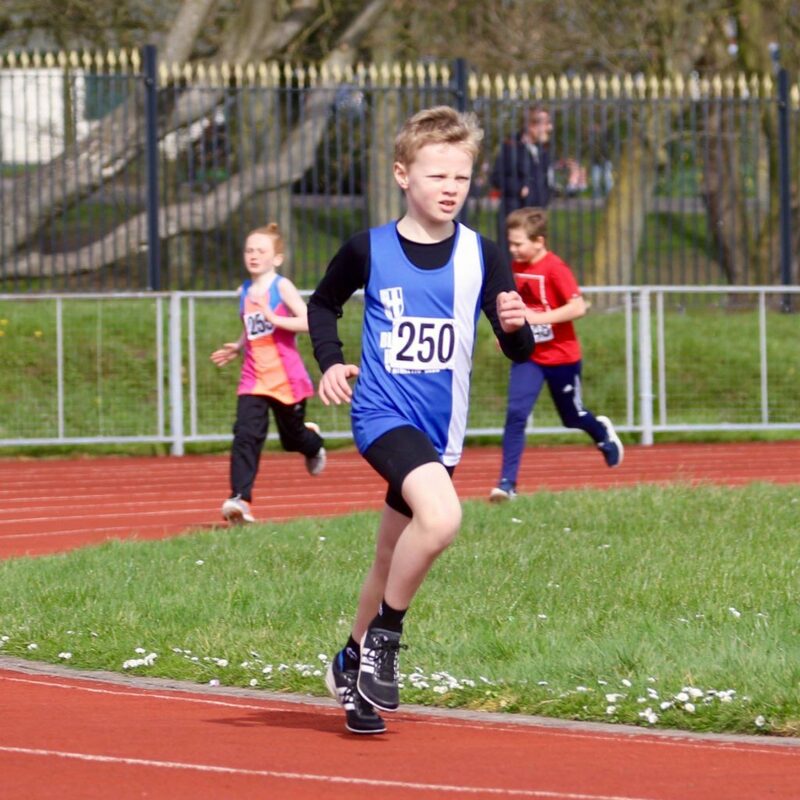 U11 Loucas Lancashire had a very good day too, winning the 600m in a new PB of 2.04.6 – bettering his previous best by over 12 seconds, set a new PB in the 80m of 13.3 (4th) and finished with a further new PB in the Long Jump of 2.88m (8th out of 21). 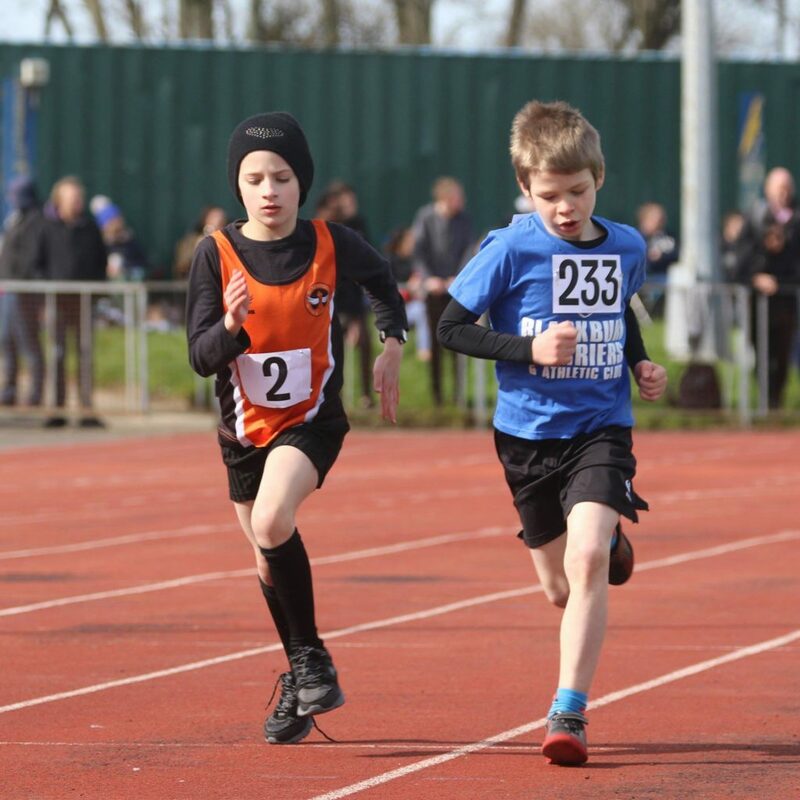 U11 Liam Bennison came 6th in the 80m (14.2), 3rd in the 600m (2.08.9) and 15th in the Long Jump (2.31m). 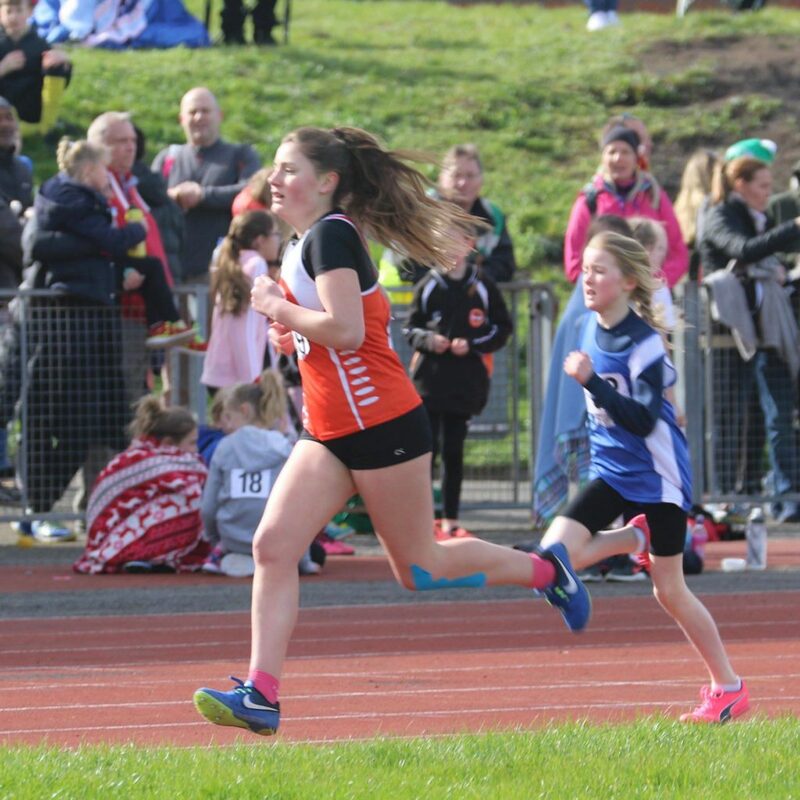 Lulu Sharp, also an U11 ran 15.1 in the 80m, 2.19.6 in the 600m and jumped 2.40m in the Long Jump. 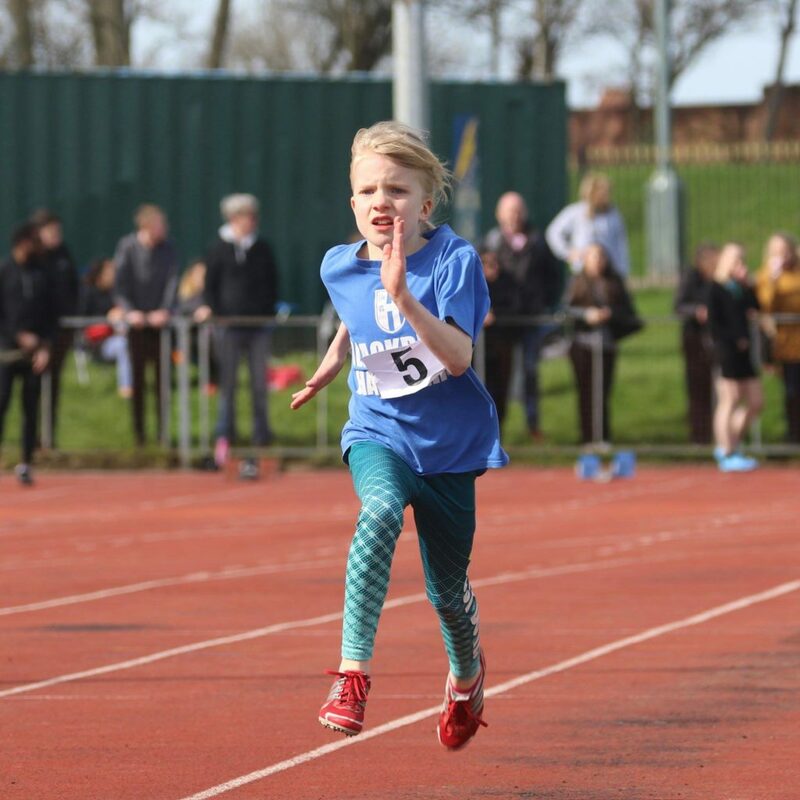 Imogen Robinson competed in the U11’s and ran 15.6 in the 100m (2nd) and 2.52.5 in the 800m (4th) which represented her first time at both distances. 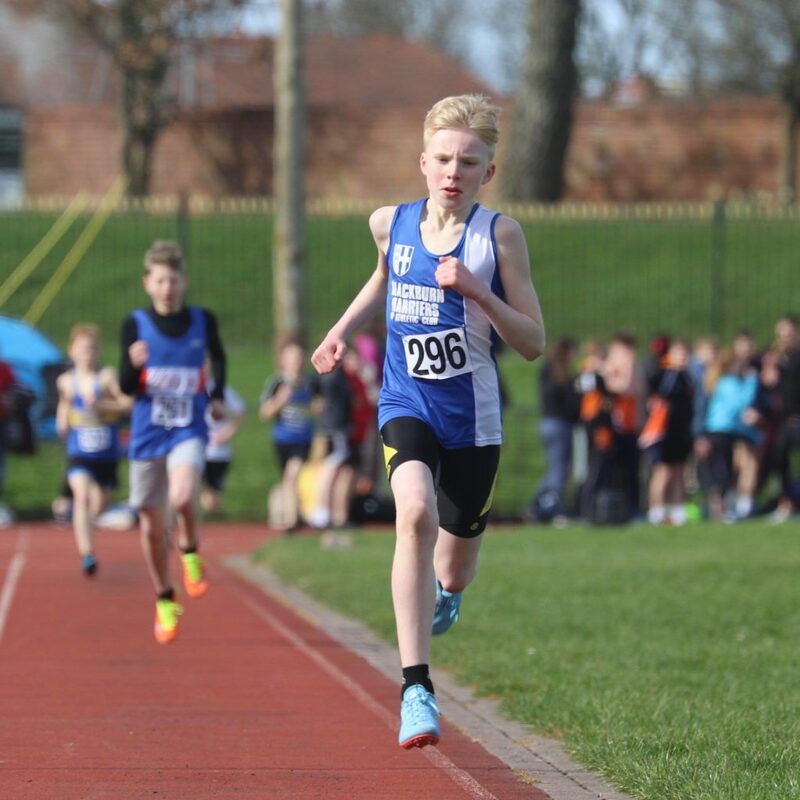 In the U13 age group – Isaac Smith ran 37.3 (6th) in the 200m and 3.28.0 in the 800m, whilst Findlay Carroll came 3rd in the 200m (33.8), 11th in the 800m (2.55.6) and jumped 2.98m in the Long Jump. 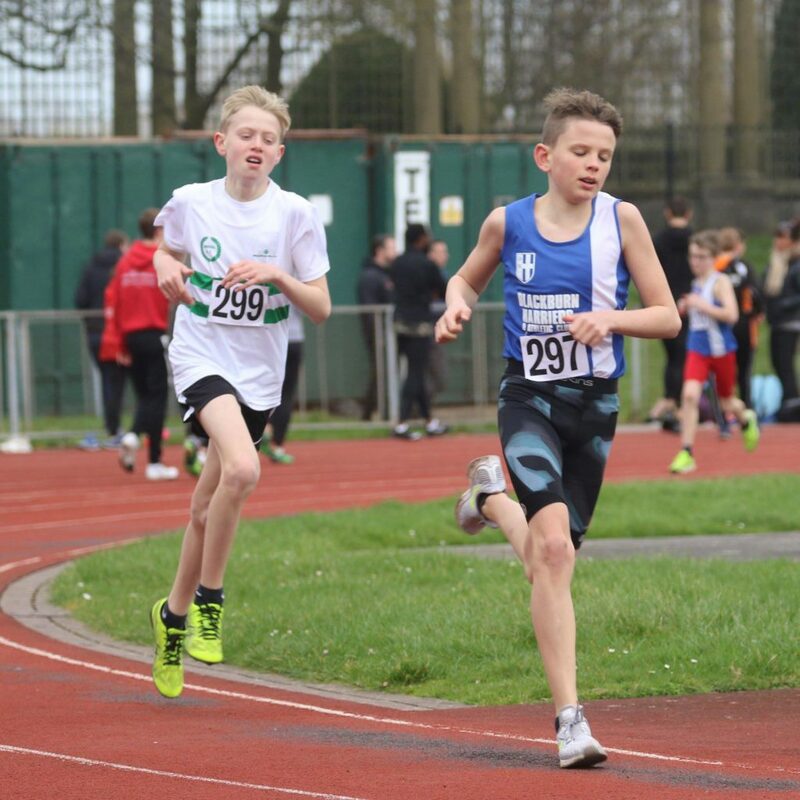 Three U13 lads ran the 1500m which saw Ben Stratton win the race in 5.03.9 – a new PB by 21 seconds with Oliver Gill in his first ever effort over the distance placing 3rd in 5.27.6 and Daniel Smith in 4th (5.36.8) – Daniel went on to set new PB’s in the 70m Hurdles coming 2nd in 13.7, some 3 seconds faster than his previous best and clearing 1.33m in the High Jump – a new PB by 3cm. Kady Thompson set two new PB’s, the first in the 70m Hurdles clocking 16.9 (5th) and placing 3rd in the High Jump with 1.25m. 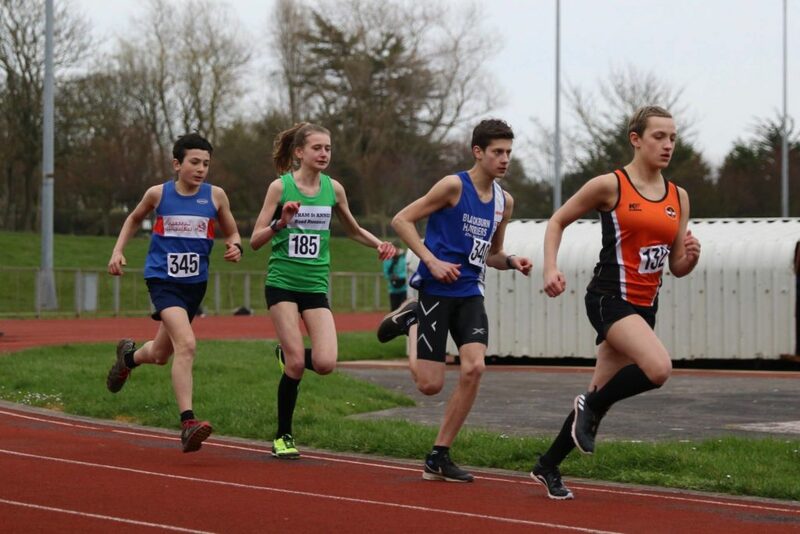 U15 Jasmine Schoefield jumped out to 3.69 in the Girls Long Jump whilst Jessica Cole, also U15 – ran 29.7 in the 200m (3rd), clocked 13.6 in the 75m Hurdles (4th) and cleared 1.35m in the High Jump (4th). 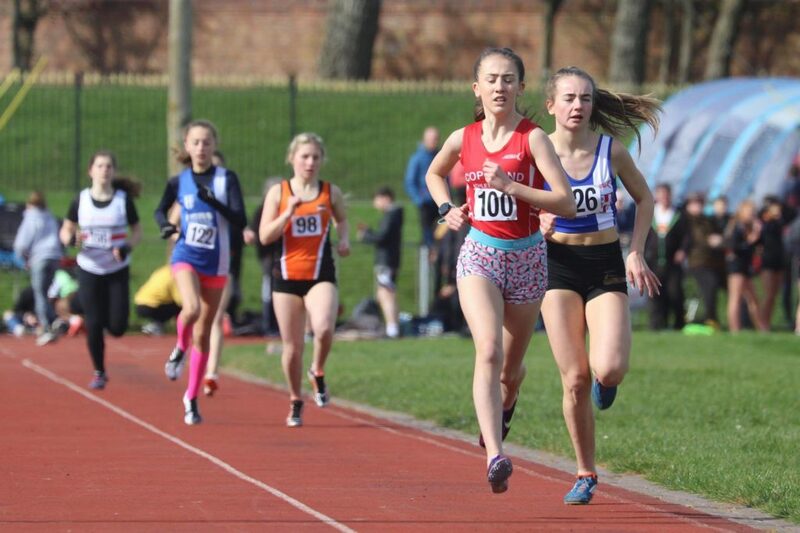 Abigail Stratton knocked a huge chunk off her previous best in winning the U15 Girls 1500m in a time of 5.07.7, 11 seconds quicker than here previous best time. 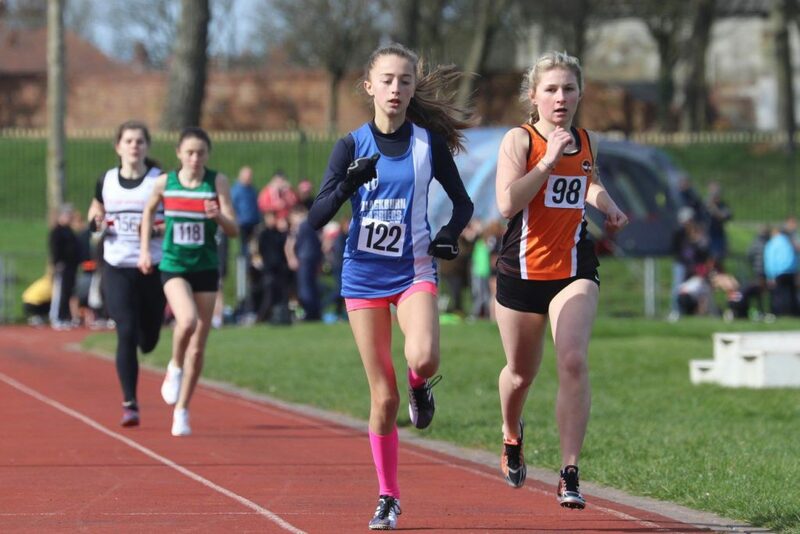 Leah Hoole and Keira Haxton took on the U15t Girls 800m clocking 2.35.2 and 2.42.3 respectively in 2nd and 3rd places – Keira then ran the 300m for the first time and clocked a time of 50.9 in 5th whilst Codie Dewhurst finished 2nd in his 300m with 50.2 followed by a 2.39.1 clocking in the 800m (6th). 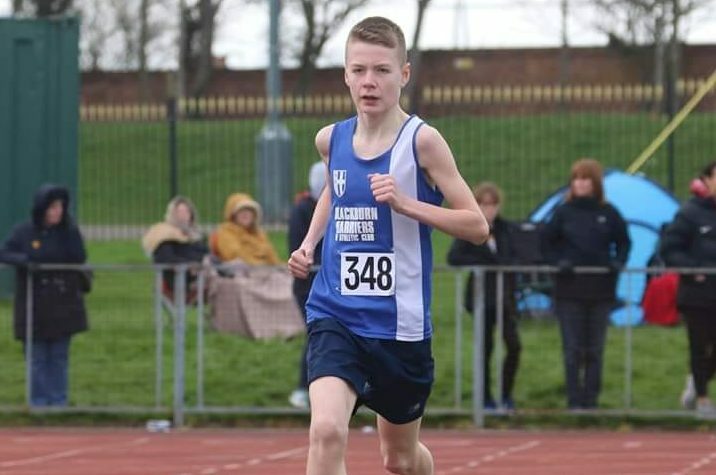 Dexta Thompson ran a solid 5.02.2 in the U15 Boys 1500m (4th) whilst Ethan Barbarewicz chopped a massive 27 seconds off his 1500m personal best to set a new PB of 4.55.2 and Saul Sharp made his debut over 3000m to clock 11.20.4 in 3rd spot. 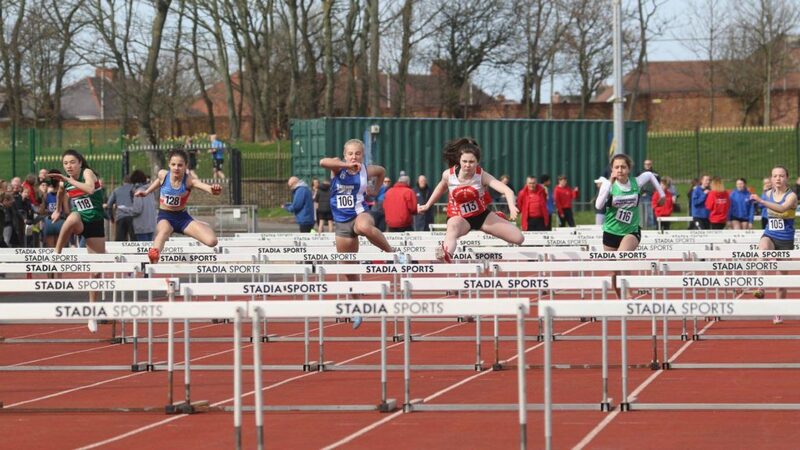 U17 Liberty Thompson equalled her personal best in the High Jump with 1.45m and came 5th in the 80m Hurdles in 14.0. 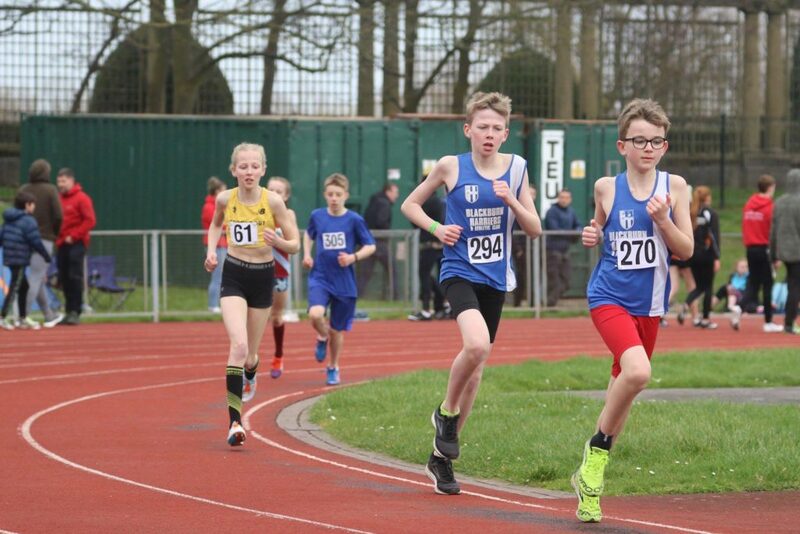 In the U11 Teams, Matthew Smith, Alfie Ward, Alisha Lehner and Alesha Hindle were selcted for the County, as were Niamh Gater, Isaac Butler, Codie Dewhurst and Aidan Downes in the U13’s and Eleesha Charnley, Myah Booth and Hayden Mercer in the U15’s. 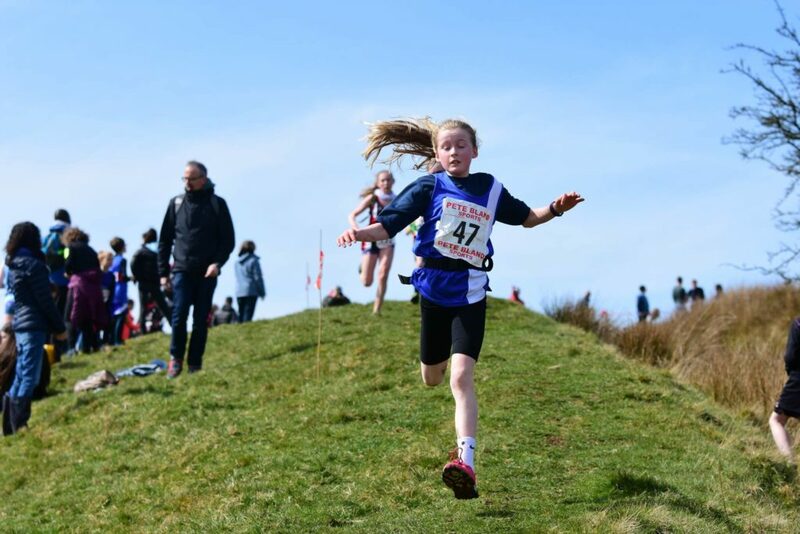 Eleesha Charnley was the 2nd U15 Girl overall in the Regional Final – beaten by just one point by the winner Katie Pimblet of Gt Manchester with the U11 Boys and U13 Girls winning the Team events to qualify for the National Championships. The U11 Boys won by amassing 473 Points to Gt. Manchester’s 465, whilst in the U11 Girls Lancashire placed 4th. The U13 Girls won as they totalled 626 Points to Merseyside’s 591 with the Boys placing 4th. 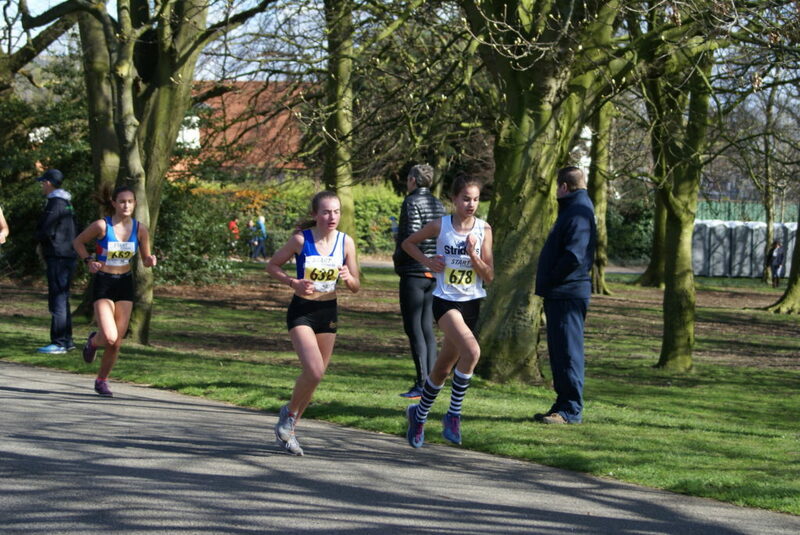 The U15 Boys finished 3rd as the U15 Girls placed 2nd behind Gt Manchester by just 13 points. 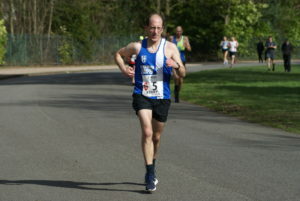 Chris Steele won this Race run over 20k at the head of a field numbering one hundred and forty six, in a time of 1hr 15.34. 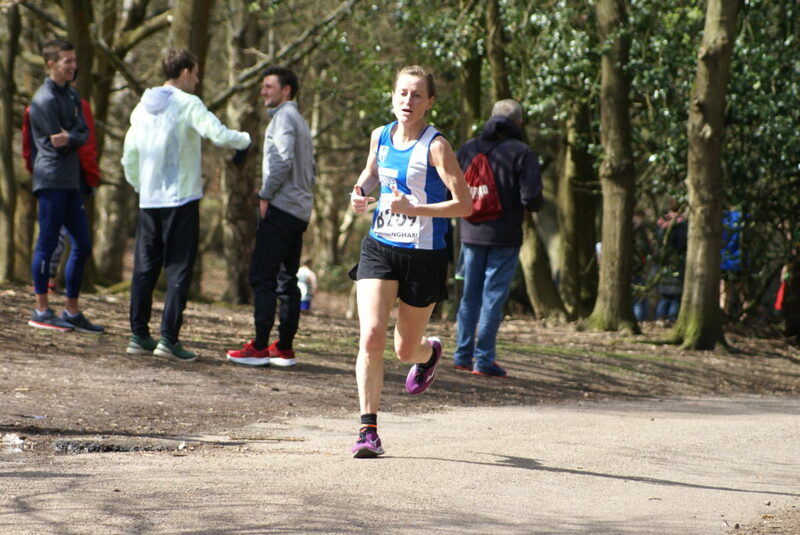 Victoria Mousley saying “it was nice to run a tough off road route” had avery good run to place 11th overall and 2nd Woman with a time of 1hr 28.37 behind the 1st Woman – Lou Stbbings 1hr.27.07 (8th). Exactly 100 finshers in this race run over 4.5miles with close to 1800 feet of climbing won by Borrowedale’s Kim Collison in 35.25. 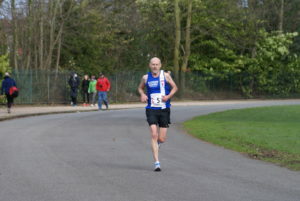 V50 John Orrell came home in 87th positoon with a time of 63.36. 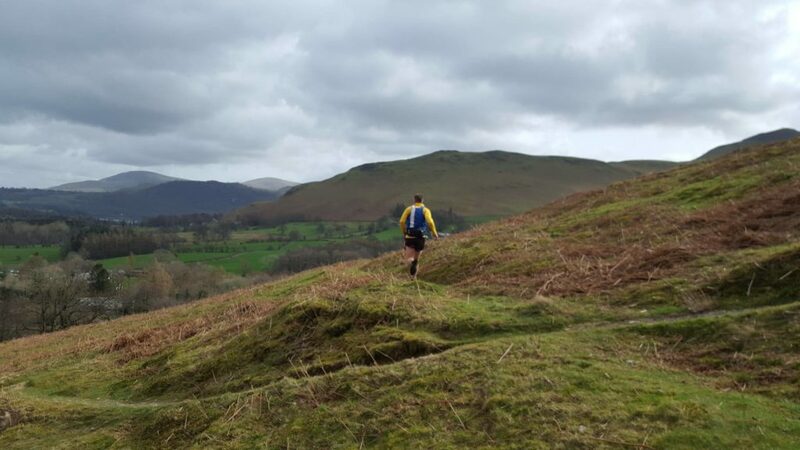 And afterwards John spoke about the day and the race saying.“With 1781ft of up, steep and rocky terrain, followed by a short ridge run, very steep grassy descent and then the rough miners track back, it was a ‘pleasant’ way to spend an hour in the Lakes! My first run for 3 weeks. 3 minutes quicker than last time and just 40 seconds shy of my best set in 2016. Suffering now though as my legs have taken a real battering”. 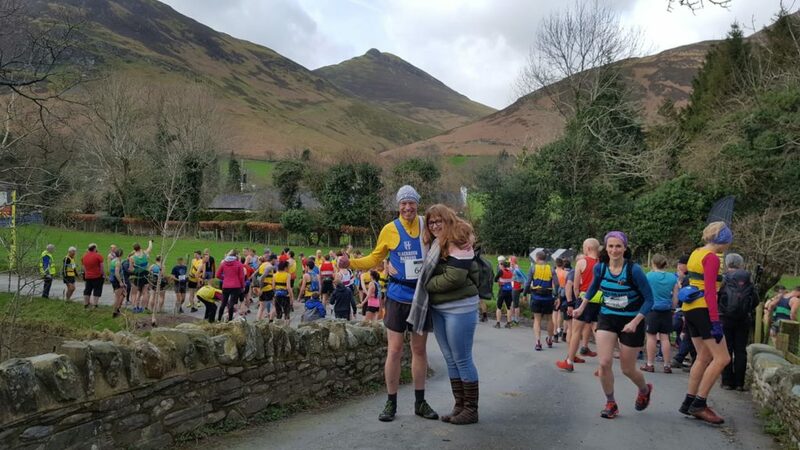 Two hunded and seventy nine finishers in this very tough race run over a distance of 15.4 miles and involves nearly 1000metres of climbing. 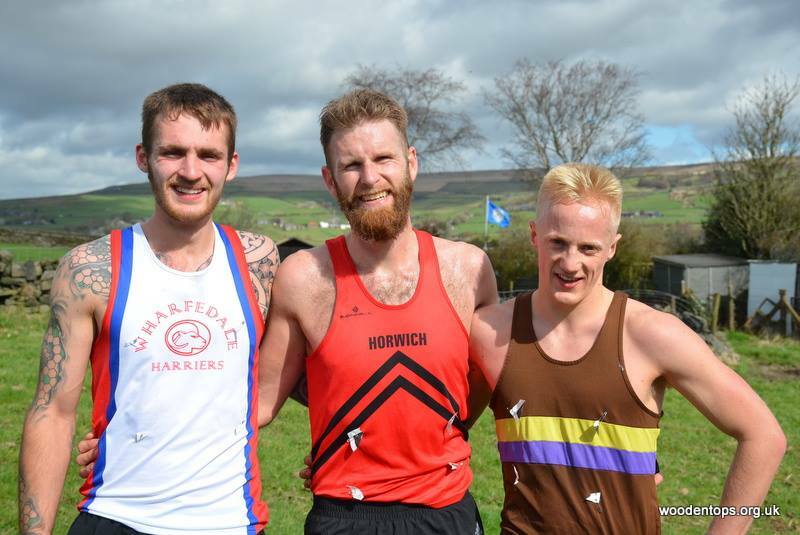 Over such a distance just 10 seconds separated 1st and 2nd in the Race with Phil Marsden (Horwich) taking the honours in a time of 1hr 50.22 from Robin Howie in 2nd (Wharfedale) clocking 1hr 50.32 with Max Wainwright (Dark Peak) 3rd (1hr 53.40). 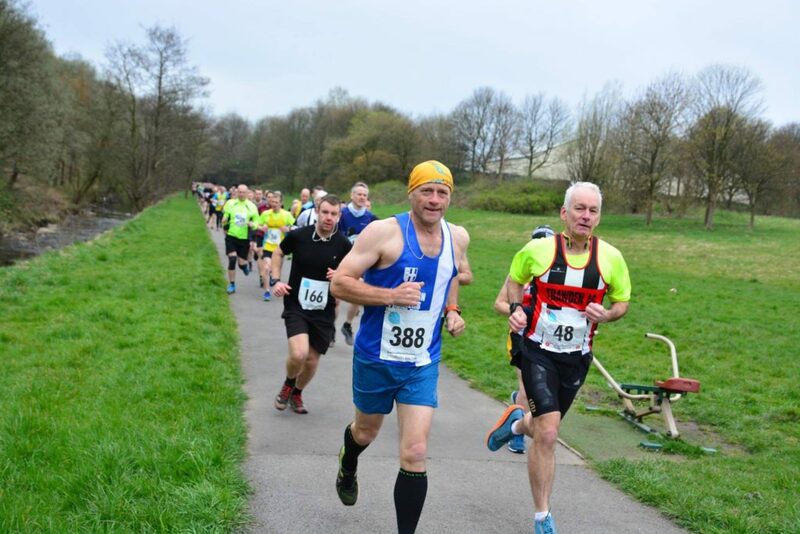 V50 Gary Pearse was next across the line in 100th spot clocking 2hr 30.04 with V50 Matt Nuttall in 163rd place running a time of 2hr 45.48. 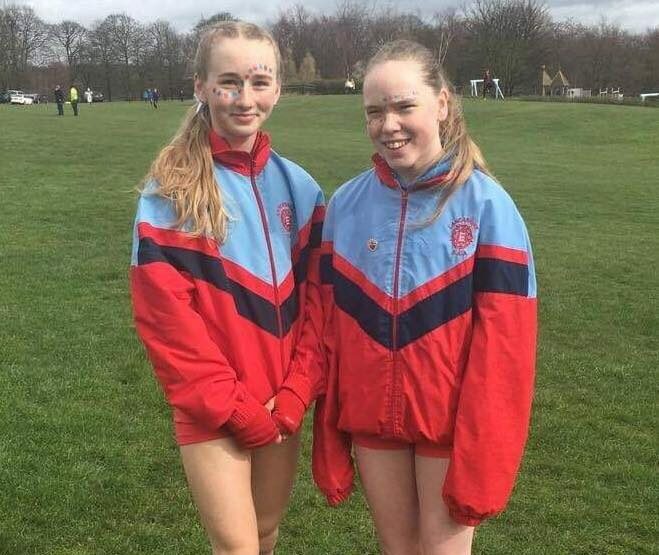 This years English Schools Cross Country Championships held in Leeds took place in the worst of conditions – cold, rain, wind and mud galore – some might say that’s proper cross country as the forty five counties lined up in Pens! 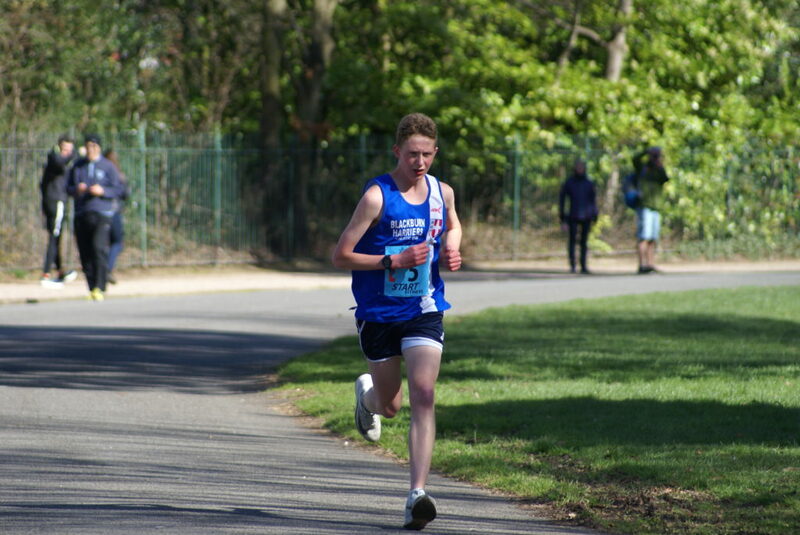 A word to for the winner of the Senior Boys Race – Sam Charlton. 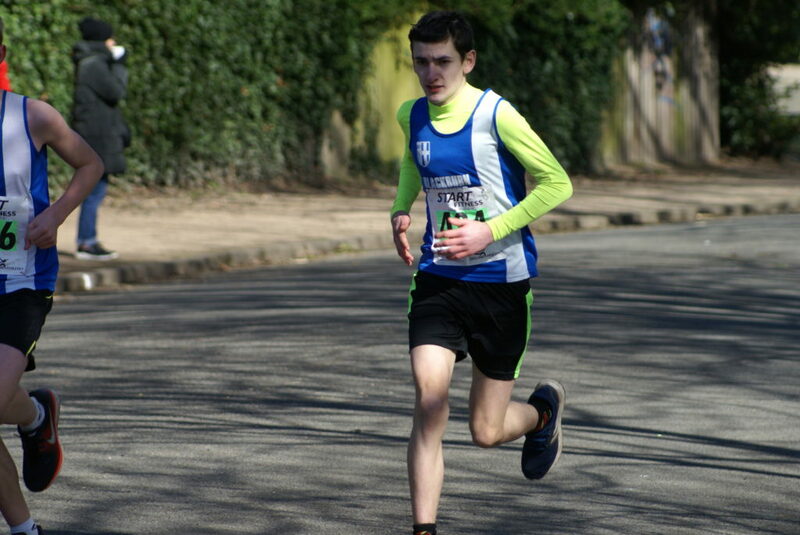 This young athlete has taken all before him this season winning cross country champions at county and regional level and then taking the National and Inter-County titles before rounding it off by winning English Schools. A hell of a performance. 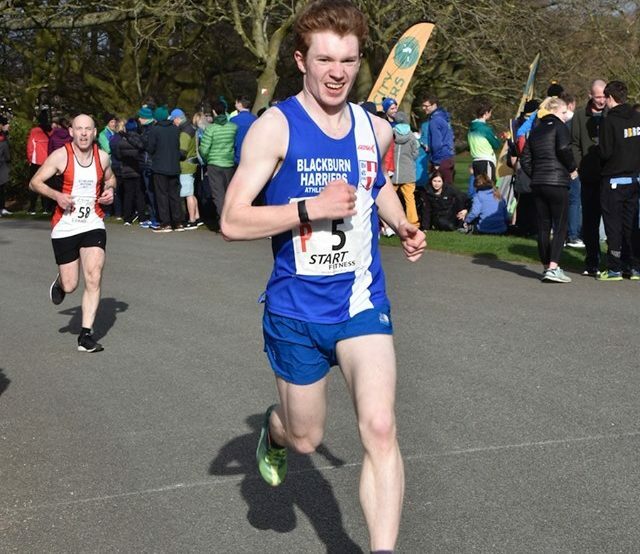 Blackburn Harriers had seven athletes selected for Lancashire with five of them counting for the County in the final results. 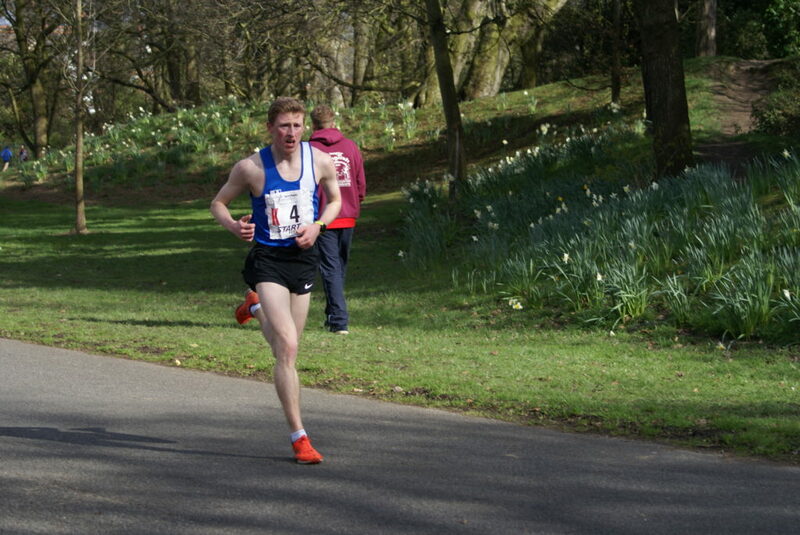 Highest placed finish of the day belonged to Matt Ramsden in the Inter-Boys Race, finishing 31st overall out of a field 331 athletes in a time of 17.57 and 3rd counter. 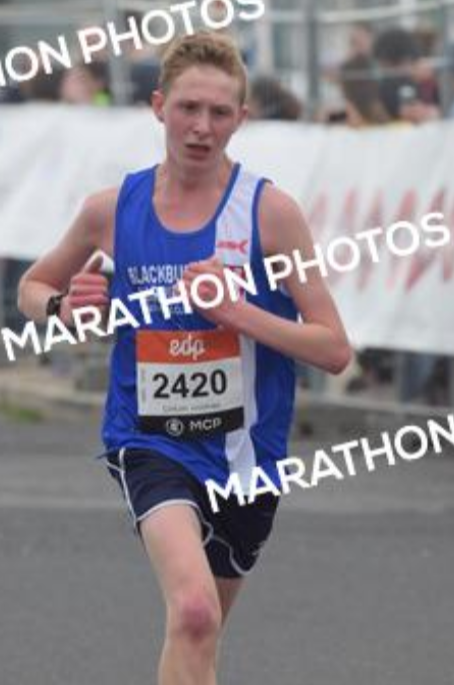 Sam Hodkinson also ran for the Lancashire team coming home in 209th place clocking 19.21. 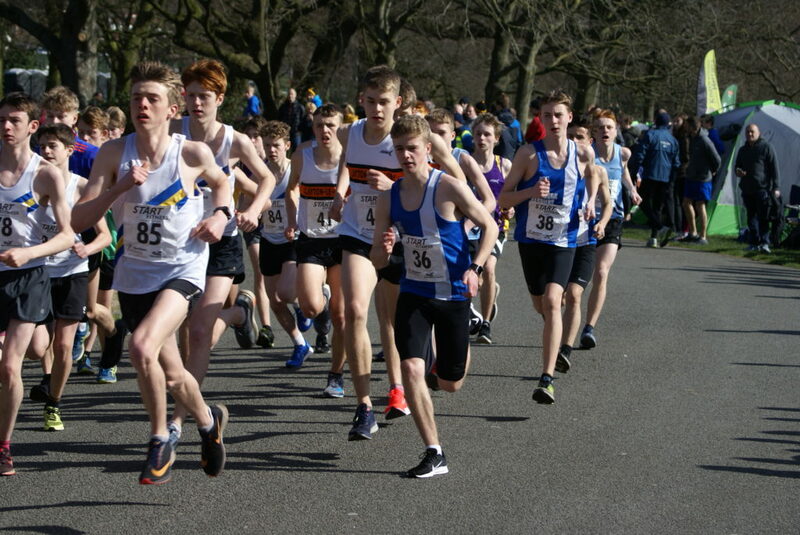 Three hundred and forty three athletes in the Junior Boys race which saw Lancashire place 27th out of the forty five County teams competing. 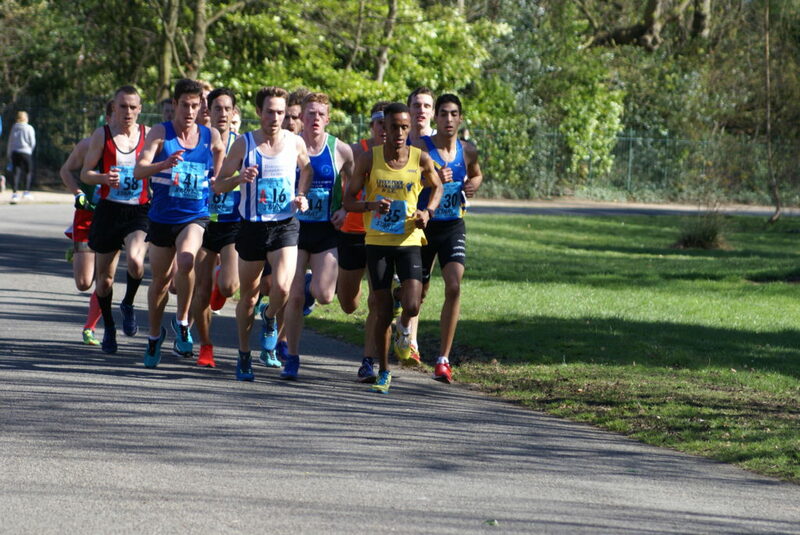 Both Blackburn Harriers counted for the team which saw Junior Boys David Holman come home in 173rd and 4th counter (15.18) with Isaac Butler 175th and 5th counter given the same time. 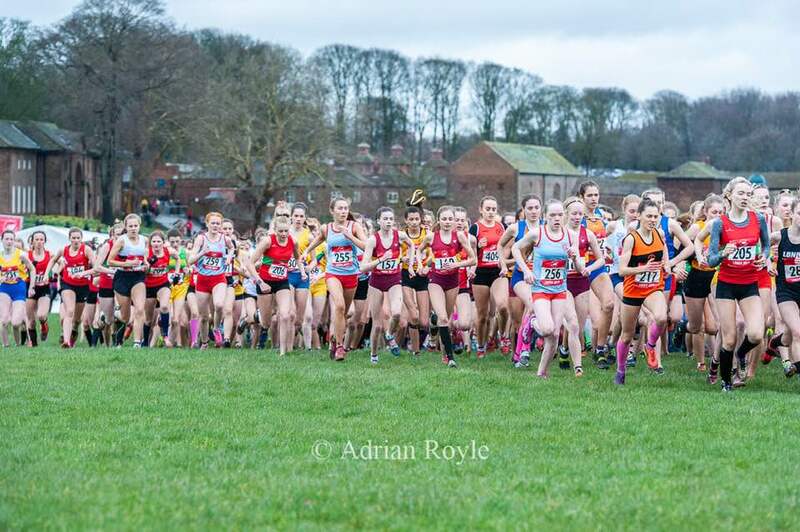 Forty three complete teams and 341 athletes took part in the Inter-Girls race featuring two athletes from Blackburn Harriers. 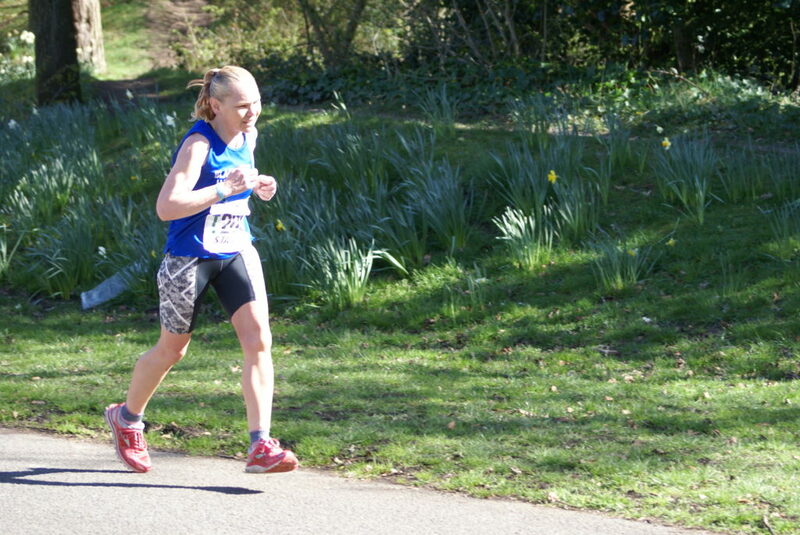 Amy Davies was 4th counter on the day in 193rd spot in a time of 15.35 with Eleesha Charnley in 247th clocking 16.02. 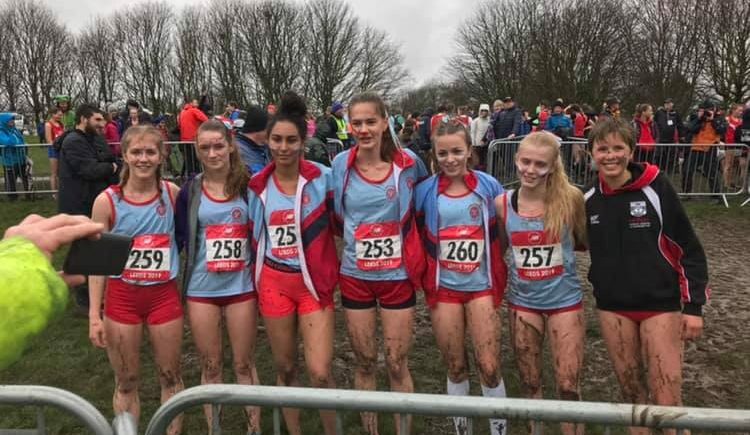 Lancashire ended up 13th out of the 38 teams racing in the Senior Girls which saw Maddie Elliott have anothert good run, coming home in 109th place in a time of 17.19 and being 4th counter for the County. 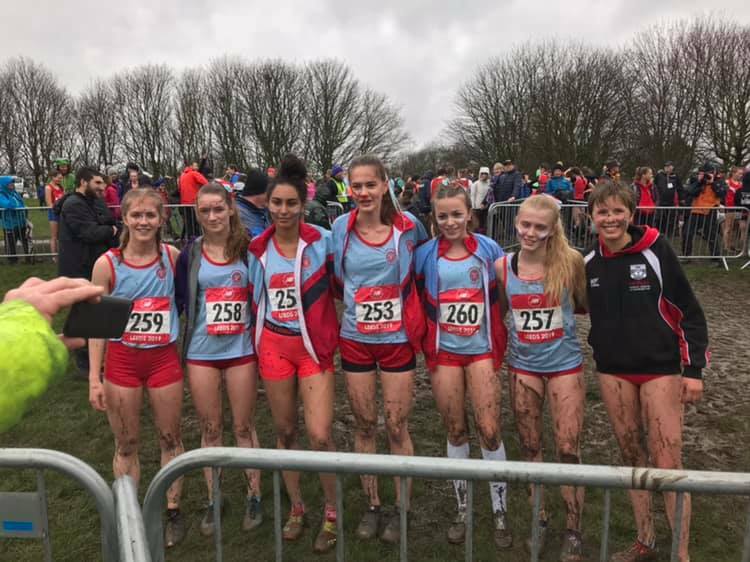 Lancashire Girls packed reall well taking 105th, 107th and 109th places behind the first counter Emily Morgan who came home in 22nd position. 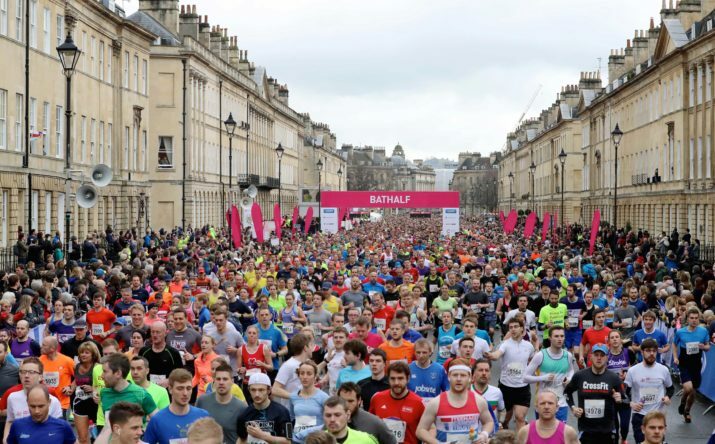 First off is the Bath Half-Marathon with Ben Fish. In 2017 Ben won this race clocking his personal best time for the distance of 65.16. 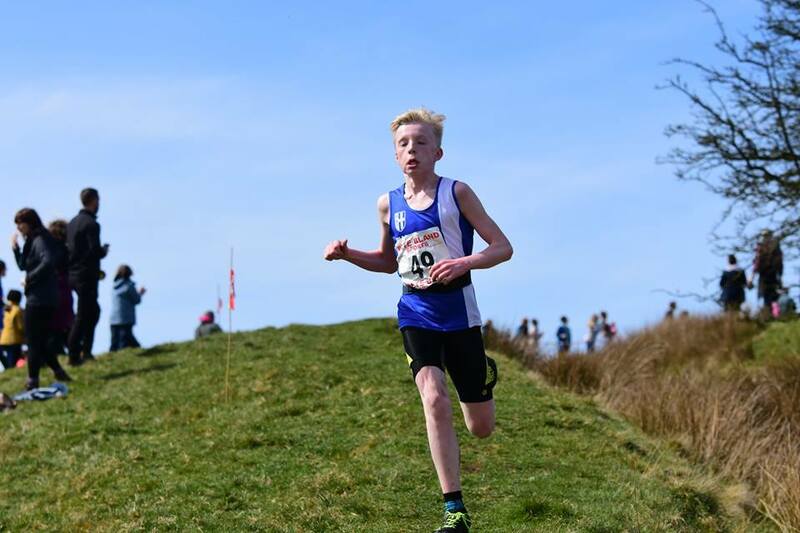 Since the National cross country Relays last November, Ben has only managed to run one race at this years Lancashire cross country championships in early January. 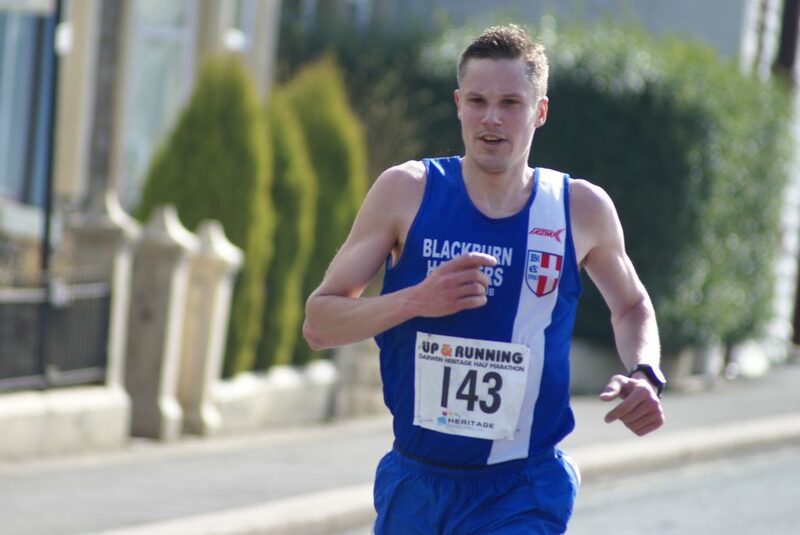 The Bath Half-Marathon being only his 2nd race in some 5 months proved to be a pretty solid comeback for him as he took a top ten finish (10th) in a time of 68.16 – the race being won by Chris Thompson in 63.10. 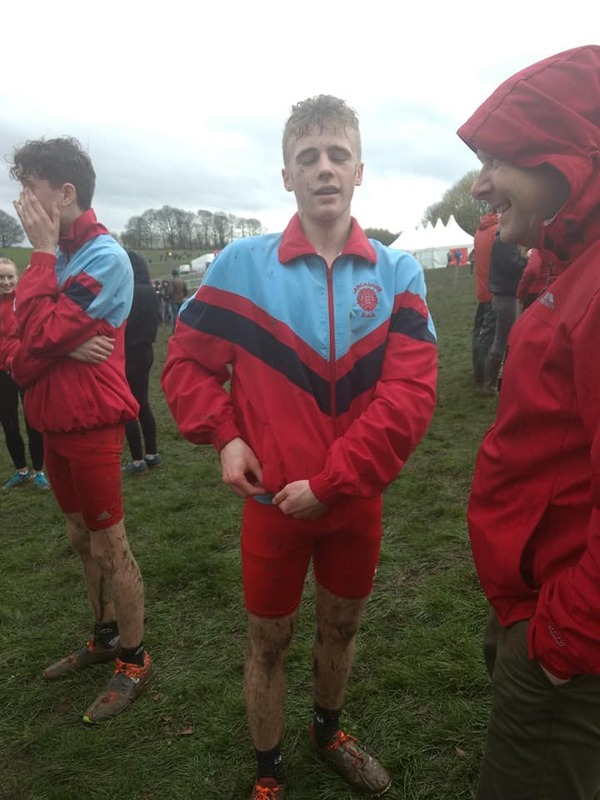 Afterwards Ben spoke to the Harriers about the day commenting “I knew it would be a stronger field this year and I also knew I wouldn’t be at my best. I didn’t have a time in mind and didn’t bother with stopwatch. 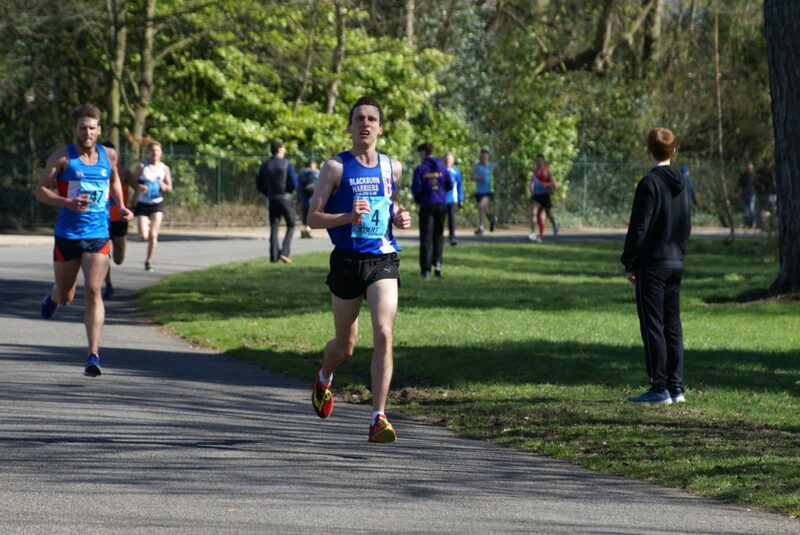 After a few miles I was 10th and I couldn’t close the gap to 9th and 8th. 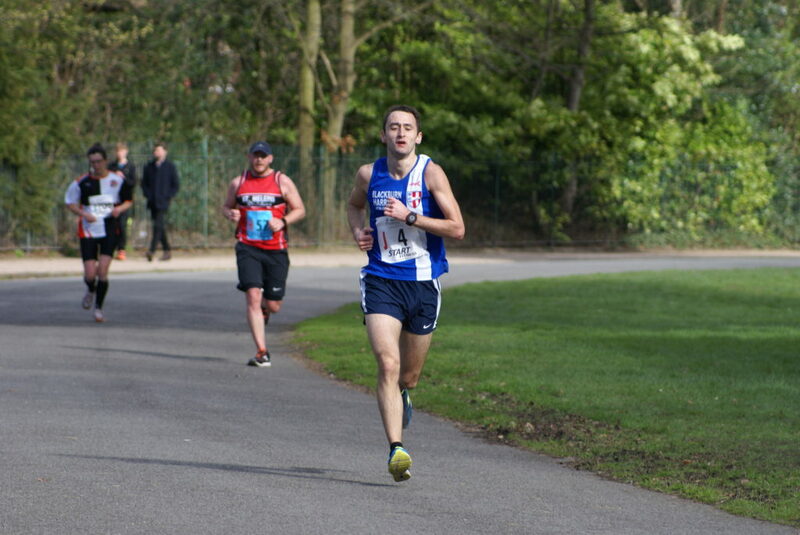 I was happy with my time, another couple of months should see me back to the level I should be at“. 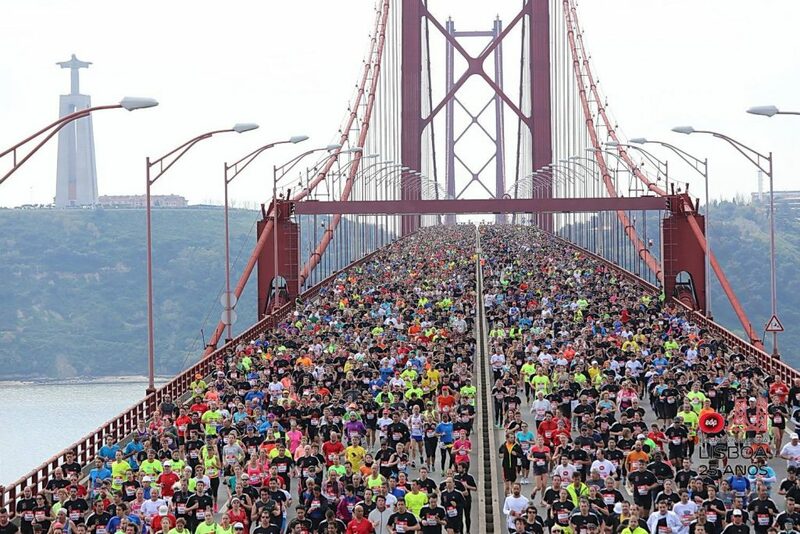 Moving over to Lisbon in Portugal with Calum Holmes who ran in the race featuring 25000 other runners. 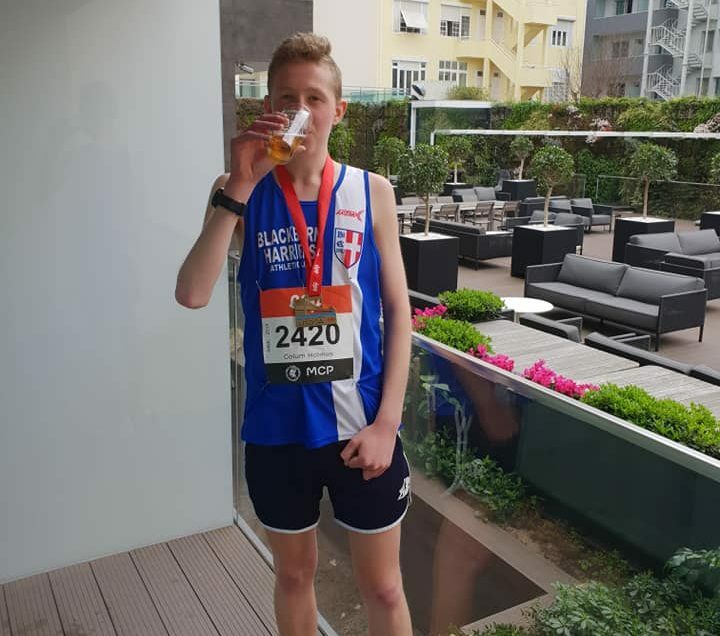 He finished 88th overall in a time of 76.12 – just missing a new personal best by six seconds and told the Harriers after the Race saying that “While enjoying an amazing holiday in Portugal I decided to have a go at the Lisbon Half Marathon and I felt confident and had a really good run unfortunately I was 5 seconds shy off my pb but just got to recover now and move on for the Northern 12 Stage relays next weekend. 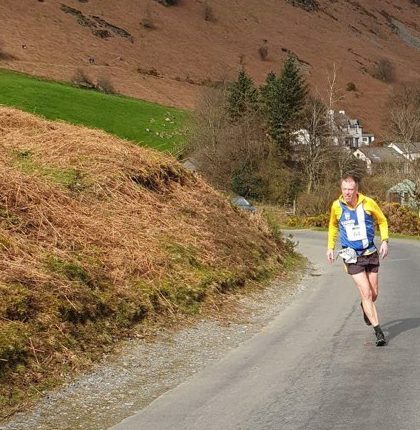 it was absolutely packed on the start line with over 25,000 keen runners and I managed to finish in the top 100 including the elites, just got to recover now and move on for the northern stage 12 relays next weekend”. 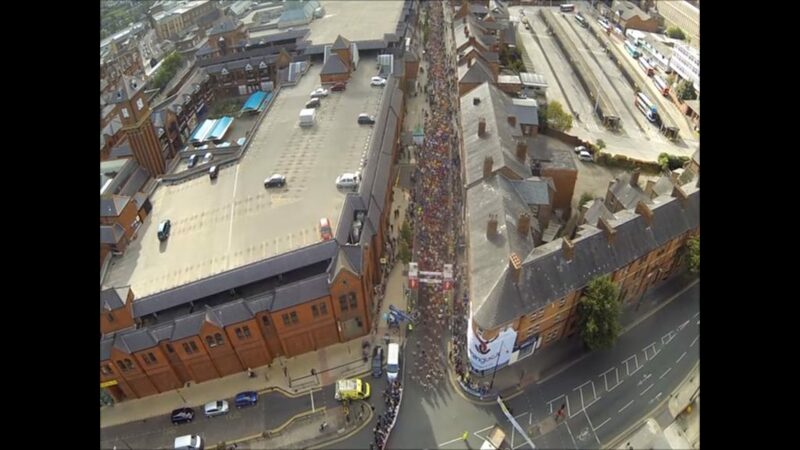 Then back to Wigan with just short of a thousand runners competing in this one. Chris Davies had a fine run coming across the finish line in 4th place overall with a time of 74.13 – just 30 seconds outside his personal best and afterwards he commented about his race and its part in his build up to the London Marathon “Overall a really pleasing result today at the Wigan Half Marathon. I wasn’t looking to PB but I was looking for a good solid run to see were I was at in the way of fitness gearing up for the London Marathon. 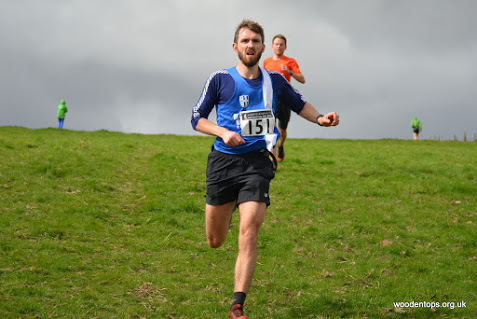 The course was tough, especially in the second half were there was a tough section from 7 – 10 miles. 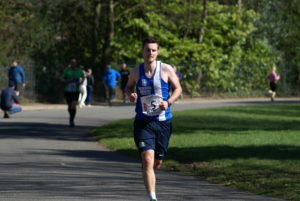 Having got through that the last three miles were easier and it allowed for a good solid finish. I am pleased with the time of 1:14:13. Everything is looking good for the Marathon. Just important now to look after myself and hopefully fingers crossed I can get the PB that I want in London”. 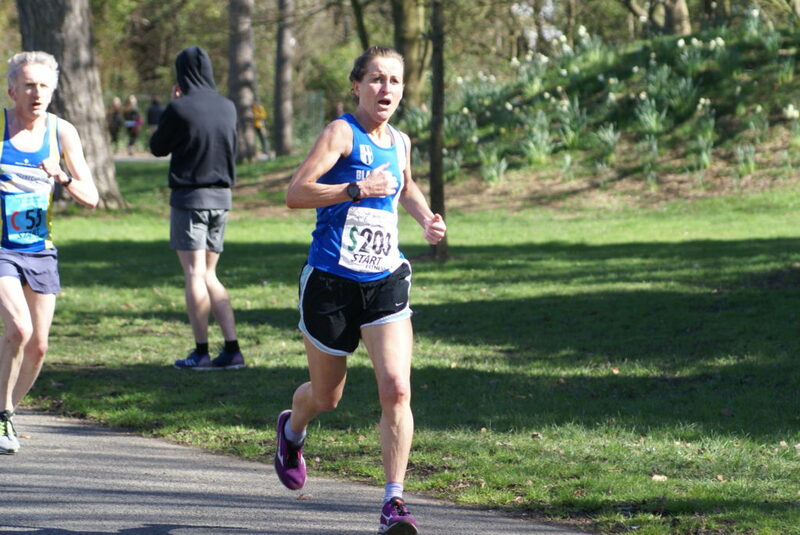 Lindsay Davies was running her second ever race over the half-marathon distance – her first in 2017 2hr 15.15 – and ran a huge new PB as she clocked 1hr 43.46 in 215th position and telling the Club “Really pleased with my result 1:43:46 wasn’t expecting to do so well on a tough course, the climb at 8 mile was extremely tough and lasted for about 2 miles, I was 19th lady and 5th V40, my 2nd ever half marathon and I enjoyed it. Well done to Chris who did amazing”. 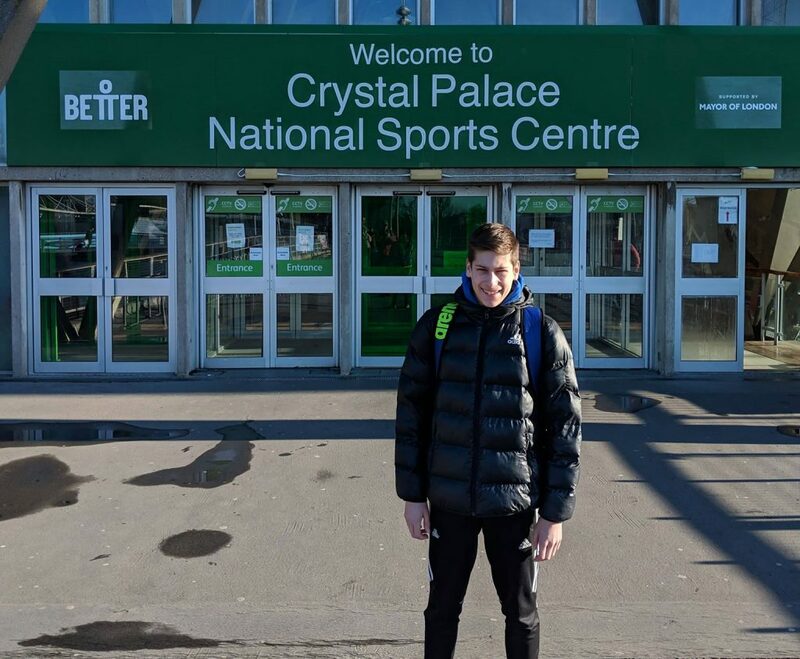 Saul Sharp had a really fine day at the British Championships held at Crystal Palace over the weekend to take a top ten finish. 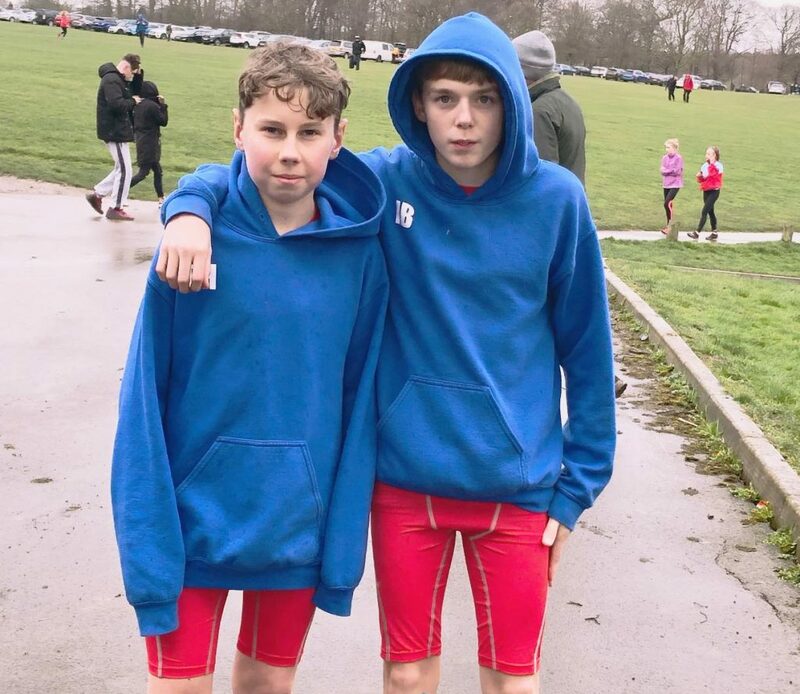 His dad and Coach – Michael Sharp – was with him at the event and commented on Saul’s performance in the Swim and Run “He had a really good swim just inside his PB 100m in 1:08.96 amassing 1164 points, leaving him 14th only 12pts behind 8th position. We talked about the run, trying to keep in the low 80s, which would give him a great chance of 8th. He delivered with an 82,87,88 and a final 400m at 80. His total points tally was 2354, to take 8th overall by one point. 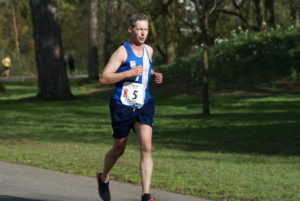 He wore his Harriers vest with pride, and it was good to see him happy and shaking everyones hand at the end of the race. Well done Saul”. And wet it was!! 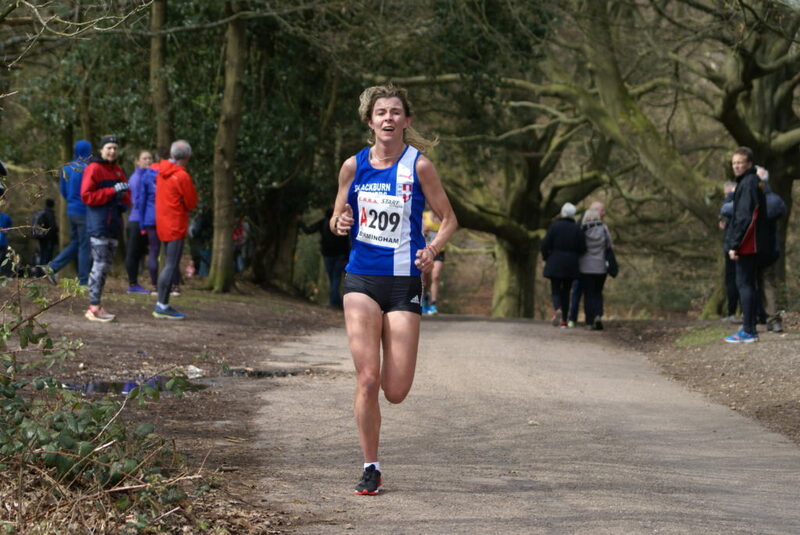 as Blackburn Harriers Michelle Teare and Jan Buckingham found out placing 94th – 59.00 and 160th – 64.22 respectively. 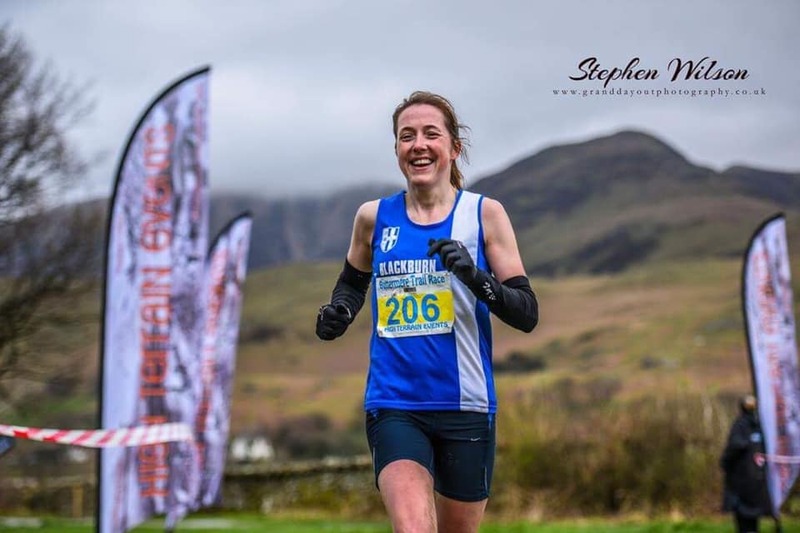 Michelle Teare told the Club that “This was my first trail race so I had no idea what to expect and was glad I was running with fellow Harrier, Jan Buckingham. 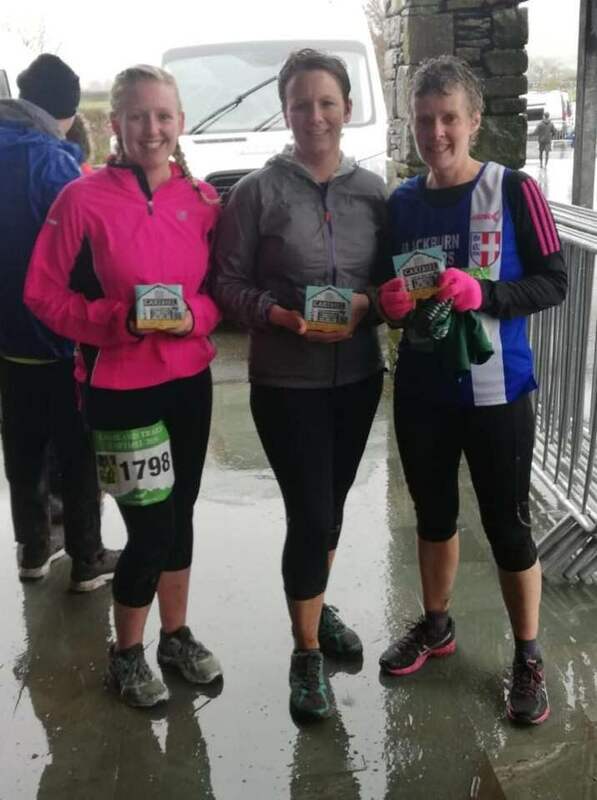 Along with every other athlete racing yesterday, I think we both wondered why on earth why we were running in such shocking weather conditions. 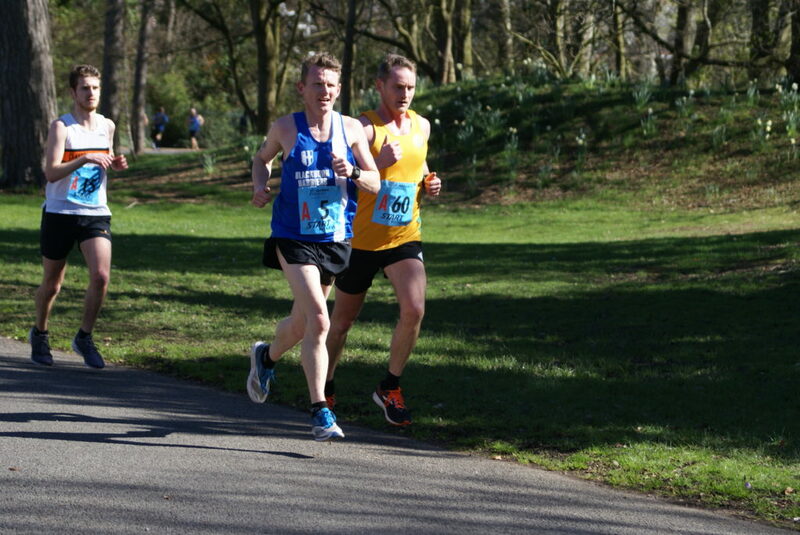 But once the race started, it didn’t matter due to concentrating on where to put your feet! The race route was interesting and well planned with constant changes in terrain and obviously plenty of water and mud! I absolutely loved it, it was challenging but also a lot of fun”.